"Reagan" redirects here. For other uses, see Reagan (disambiguation) and Ronald Reagan (disambiguation). Ronald Wilson Reagan was born on February 6, 1911, in an apartment on the second floor of a commercial building in Tampico, Illinois. He was the younger son of Nelle Clyde (née Wilson; 1883–1962) and Jack Reagan (1883–1941). Jack was a salesman and storyteller whose grandparents were Irish Catholic emigrants from County Tipperary, while Nelle was of half English and half Scottish descent (her mother was born in Surrey). Reagan's older brother, Neil Reagan (1908–1996), became an advertising executive. Reagan's father nicknamed his son "Dutch", due to his "fat little Dutchman"-like appearance and "Dutchboy" haircut; the nickname stuck with him throughout his youth. Reagan's family briefly lived in several towns and cities in Illinois, including Monmouth, Galesburg, and Chicago. In 1919, they returned to Tampico and lived above the H. C. Pitney Variety Store until finally settling in Dixon. After his election as president, Reagan resided in the upstairs White House private quarters, and he would quip that he was "living above the store again". Ronald Reagan wrote that his mother "always expected to find the best in people and often did". She attended the Disciples of Christ church regularly and was active, and very influential, within it; she frequently led Sunday school services and gave the Bible readings to the congregation during the services. A strong believer in the power of prayer, she led prayer meetings at church and was in charge of mid-week prayers when the pastor was out of town. She was also an adherent of the Social Gospel movement. Her strong commitment to the church is what induced her son Ronald to become a Protestant Christian rather than a Roman Catholic like his father. He also stated that she strongly influenced his own beliefs: "I know that she planted that faith very deeply in me." Reagan identified himself as a born-again Christian. According to Paul Kengor, author of God and Ronald Reagan, Reagan had a particularly strong faith in the goodness of people; this faith stemmed from the optimistic faith of his mother and the Disciples of Christ faith, into which he was baptized in 1922. For that period of time, which was long before the civil rights movement, Reagan's opposition to racial discrimination was unusual and commendable. He recalled the time in Dixon when the proprietor of a local inn would not allow black people to stay there, and he brought them back to his house. His mother invited them to stay overnight and have breakfast the next morning. His father was strongly opposed to the Ku Klux Klan due to his Catholic heritage, but also due to the Klan's anti-semitism and anti-black racism. After the closure of the Pitney Store in 1920 and the family's move to Dixon, the Midwestern "small universe" had a lasting impression on Reagan. Reagan attended Dixon High School, where he developed interests in acting, sports, and storytelling. His first job involved working as a lifeguard at the Rock River in Lowell Park in 1927. Over a six-year period, Reagan reportedly performed 77 rescues as a lifeguard. He attended Eureka College, a Disciples-oriented liberal arts school, where he became a member of the Tau Kappa Epsilon fraternity, a cheerleader, and studied economics and sociology. While involved, the Miller Center of Public Affairs described him as an "indifferent student". He majored in economics and sociology and graduated with a C grade. He developed a reputation as a "jack of all trades", excelling in campus politics, sports, and theater. He was a member of the football team and captain of the swim team. He was elected student body president and led a student revolt against the college president after the president tried to cut back the faculty. After graduating from Eureka in 1932, Reagan drove to Iowa, where he held jobs as a radio announcer at several stations. He moved to WHO radio in Des Moines as an announcer for Chicago Cubs baseball games. His specialty was creating play-by-play accounts of games using only basic descriptions that the station received by wire as the games were in progress. While traveling with the Cubs in California in 1937, Reagan took a screen test that led to a seven-year contract with Warner Brothers studios. He spent the first few years of his Hollywood career in the "B film" unit, where, Reagan joked, the producers "didn't want them good; they wanted them Thursday". He earned his first screen credit with a starring role in the 1937 movie Love Is on the Air, and by the end of 1939 he had already appeared in 19 films, including Dark Victory with Bette Davis and Humphrey Bogart. Before the film Santa Fe Trail with Errol Flynn in 1940, he played the role of George "The Gipper" Gipp in the film Knute Rockne, All American; from it, he acquired the lifelong nickname "the Gipper." In 1941, exhibitors voted him the fifth most popular star from the younger generation in Hollywood. Reagan played his favorite acting role in 1942's Kings Row, where he plays a double amputee who recites the line "Where's the rest of me? "—later used as the title of his 1965 autobiography. Many film critics considered Kings Row to be his best movie, though the film was condemned by The New York Times critic Bosley Crowther. Although Kings Row was good enough to make Reagan a star—Warner immediately tripled his salary to $3,000 a week—the film was released in February 1942, after the United States entered World War II. Early that year, he was ordered to military active duty in San Francisco and never became a true film star. In the post-war era, after being separated from almost four years of stateside service with the 1st Motion Picture Unit in December 1945, Reagan co-starred in such films as The Voice of the Turtle, John Loves Mary, The Hasty Heart, Bedtime for Bonzo, Cattle Queen of Montana, Tennessee's Partner, Hellcats of the Navy (the only film in which he appears with Nancy Reagan), and the 1964 remake The Killers (his final film). Throughout his film career, Reagan's mother answered much of his fan mail. After completing 14 home-study Army Extension Courses, Reagan enlisted in the Army Enlisted Reserve and was commissioned a second lieutenant in the Officers' Reserve Corps of the Cavalry on May 25, 1937. On April 18, 1942, Reagan was ordered to active duty for the first time. Due to his poor eyesight, he was classified for limited service only, which excluded him from serving overseas. His first assignment was at the San Francisco Port of Embarkation at Fort Mason, California, as a liaison officer of the Port and Transportation Office. Upon the approval of the Army Air Forces (AAF), he applied for a transfer from the cavalry to the AAF on May 15, 1942, and was assigned to AAF Public Relations and subsequently to the First Motion Picture Unit (officially, the "18th Army Air Force Base Unit") in Culver City, California. On January 14, 1943, he was promoted to first lieutenant and was sent to the Provisional Task Force Show Unit of This Is the Army at Burbank, California. He returned to the First Motion Picture Unit after completing this duty and was promoted to captain on July 22, 1943. In January 1944, Reagan was ordered to temporary duty in New York City to participate in the opening of the Sixth War Loan Drive, which campaigned for the purchase of war bonds. He was reassigned to the First Motion Picture Unit on November 14, 1944, where he remained until the end of World War II. He was recommended for promotion to major on February 2, 1945, but this recommendation was disapproved on July 17 of that year. While with the First Motion Picture Unit in 1945, he was indirectly involved in discovering actress Marilyn Monroe. He returned to Fort MacArthur, California, where he was separated from active duty on December 9, 1945. By the end of the war, his units had produced some 400 training films for the AAF. Reagan was first elected to the Board of Directors of the Screen Actors Guild (SAG) in 1941, serving as an alternate member. After World War II, he resumed service and became third vice-president in 1946. The adoption of conflict-of-interest bylaws in 1947 led the SAG president and six board members to resign; Reagan was nominated in a special election for the position of president and was subsequently elected. He was chosen by the membership to serve seven additional one-year terms, from 1947 to 1952 and in 1959. Reagan led the SAG through eventful years that were marked by labor-management disputes, the Taft–Hartley Act, the House Un-American Activities Committee (HUAC) hearings and the Hollywood blacklist era. During the late 1940s, Reagan and his then-wife, Jane Wyman, provided the FBI with the names of actors within the motion picture industry whom they believed to be communist sympathizers. Though he expressed reservations, he said, "Do they expect us to constitute ourselves as a little FBI of our own and determine just who is a Commie and who isn't?" Reagan also testified on the subject before the House Un-American Activities Committee. A fervent anti-communist, he reaffirmed his commitment to democratic principles, stating, "I never as a citizen want to see our country become urged, by either fear or resentment of this group, that we ever compromise with any of our democratic principles through that fear or resentment." Though an early critic of television, Reagan landed fewer film roles in the late 1950s and decided to join the medium. He was hired as the host of General Electric Theater, a series of weekly dramas that became very popular. His contract required him to tour General Electric (GE) plants 16 weeks out of the year, which often demanded that he give 14 speeches per day. He earned approximately $125,000 (equivalent to $1.0 million in 2018) in this role. 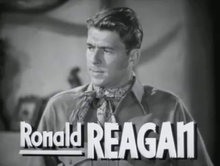 The show ran for 10 seasons from 1953 to 1962, which increased Reagan's profile in American households. He had previously appeared in feature films mostly in supporting roles or as a "second lead". In his final work as a professional actor, Reagan was a host and performer from 1964 to 1965 on the television series Death Valley Days. Reagan and future wife Nancy Davis appeared together on television several times, including an episode of General Electric Theater in 1958 called "A Turkey for the President". In 1938, Reagan co-starred in the film Brother Rat with actress Jane Wyman (1917–2007). They announced their engagement at the Chicago Theatre and married on January 26, 1940 at the Wee Kirk o' the Heather church in Glendale, California. Together they had two biological children, Maureen (1941–2001) and Christine (b. in 1947 but lived only one day), and adopted a third, Michael (b. 1945). 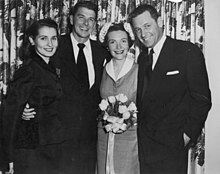 After the couple had arguments about Reagan's political ambitions, Wyman filed for divorce in 1948, citing a distraction due to her husband's Screen Actors Guild union duties; the divorce was finalized in 1949. Wyman, who was a registered Republican, also stated that their break-up was due to a difference in politics (Reagan was still a Democrat at the time). When Reagan became President 32 years later, he had the distinction of being the only divorced person to assume the nation's highest office; Donald Trump (2 divorces) would follow him in that respect 36 years later. Reagan and Wyman continued to be friends until his death, with Wyman voting for Reagan in both of his runs and, upon his death, saying "America has lost a great president and a great, kind, and gentle man." 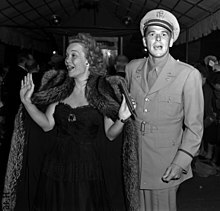 Reagan met actress Nancy Davis (1921–2016) in 1949 after she contacted him in his capacity as president of the Screen Actors Guild. He helped her with issues regarding her name appearing on a Communist blacklist in Hollywood. She had been mistaken for another Nancy Davis. She described their meeting by saying, "I don't know if it was exactly love at first sight, but it was pretty close." They were engaged at Chasen's restaurant in Los Angeles and were married on March 4, 1952, at the Little Brown Church in the Valley (North Hollywood, now Studio City) San Fernando Valley. Actor William Holden served as best man at the ceremony. They had two children: Patti (b. 1952) and Ronald "Ron" Jr. (b. 1958). Observers described the Reagans' relationship as close, authentic and intimate. During his presidency, they reportedly displayed frequent affection for one another; one press secretary said, "They never took each other for granted. They never stopped courting." He often called her "Mommy" and she called him "Ronnie." He once wrote to her, "Whatever I treasure and enjoy... all would be without meaning if I didn't have you." When he was in the hospital in 1981 after an assassination attempt, she slept with one of his shirts to be comforted by his scent. In a letter to the American people in 1994, Reagan wrote "I have recently been told that I am one of the millions of Americans who will be afflicted with Alzheimer's disease... I only wish there was some way I could spare Nancy from this painful experience," and in 1998, while he was stricken by Alzheimer's, Nancy told Vanity Fair, "Our relationship is very special. We were very much in love and still are. When I say my life began with Ronnie, well, it's true. It did. I can't imagine life without him." Nancy Reagan died on March 6, 2016 at the age of 94. Reagan began as a Hollywood Democrat, and Franklin D. Roosevelt was "a true hero" to him. He moved to the right-wing in the 1950s, became a Republican in 1962, and emerged as a leading conservative spokesman in the Goldwater campaign of 1964. In his early political career, he joined numerous political committees with a left-wing orientation, such as the American Veterans Committee. He fought against Republican-sponsored right-to-work legislation and supported Helen Gahagan Douglas in 1950 when she was defeated for the Senate by Richard Nixon. It was his realization that Communists were a powerful backstage influence in those groups that led him to rally his friends against them. At rallies, Reagan spoke frequently with a strong ideological dimension. In December 1945, he was stopped from leading an anti-nuclear rally in Hollywood by pressure from the Warner Bros. studio. He would later make nuclear weapons a key point of his presidency when he specifically stated his opposition to mutual assured destruction. Reagan also built on previous efforts to limit the spread of nuclear weapons. In the 1948 presidential election, Reagan strongly supported Harry S. Truman and appeared on stage with him during a campaign speech in Los Angeles. In the early 1950s, his relationship with actress Nancy Davis grew, and he shifted to the right when he endorsed the presidential candidacies of Dwight D. Eisenhower (1952 and 1956) and Richard Nixon (1960). Reagan was hired by General Electric (GE) in 1954 to host the General Electric Theater, a weekly TV drama series. He also traveled across the country to give motivational speeches to over 200,000 GE employees. His many speeches—which he wrote himself—were non-partisan but carried a conservative, pro-business message; he was influenced by Lemuel Boulware, a senior GE executive. Boulware, known for his tough stance against unions and his innovative strategies to win over workers, championed the core tenets of modern American conservatism: free markets, anticommunism, lower taxes, and limited government. Eager for a larger stage, but not allowed to enter politics by GE, he quit and formally registered as a Republican. He often said, "I didn't leave the Democratic Party. The party left me." When the legislation that would become Medicare was introduced in 1961, he created a recording for the American Medical Association (AMA) warning that such legislation would mean the end of freedom in America. Reagan said that if his listeners did not write letters to prevent it, "we will awake to find that we have socialism. And if you don't do this, and if I don't do it, one of these days, you and I are going to spend our sunset years telling our children, and our children's children, what it once was like in America when men were free." Other Democratic initiatives he opposed in the 1960s included the Food Stamp Program, raising the minimum wage, and the establishment of the Peace Corps. He also joined the National Rifle Association (NRA) and would become a lifetime member. The Founding Fathers knew a government can't control the economy without controlling people. And they knew when a government sets out to do that, it must use force and coercion to achieve its purpose. So we have come to a time for choosing ... You and I are told we must choose between a left or right, but I suggest there is no such thing as a left or right. There is only an up or down. Up to man's age-old dream—the maximum of individual freedom consistent with order—or down to the ant heap of totalitarianism. This "A Time for Choosing" speech was not enough to turn around the faltering Goldwater campaign, but it was the key event that established Reagan's national political visibility. California Republicans were impressed with Reagan's political views and charisma after his "Time for Choosing" speech, and in late 1965 he announced his campaign for Governor in the 1966 election. He defeated former San Francisco mayor George Christopher in the GOP primary. In Reagan's campaign, he emphasized two main themes: "to send the welfare bums back to work," and, in reference to burgeoning anti-war and anti-establishment student protests at the University of California at Berkeley, "to clean up the mess at Berkeley." In 1966, Reagan accomplished what both U.S. Senator William F. Knowland in 1958 and former Vice President Richard Nixon in 1962 had attempted to do: he was elected, defeating two-term governor Pat Brown, and was sworn in on January 2, 1967. In his first term, he froze government hiring and approved tax hikes to balance the budget. Shortly after assuming his gubernatorial term, Reagan tested the 1968 presidential waters as part of a "Stop Nixon" movement, hoping to cut into Nixon's southern support and become a compromise candidate if neither Nixon nor second-place candidate Nelson Rockefeller received enough delegates to win on the first ballot at the Republican convention. However, by the time of the convention, Nixon had 692 delegate votes, 25 more than he needed to secure the nomination, followed by Rockefeller with Reagan in third place. Reagan was involved in several high-profile conflicts with the protest movements of the era, including his public criticism of university administrators for tolerating student demonstrations at the University of California, Berkeley campus. On May 15, 1969, during the People's Park protests at the university's campus (the original purpose of which was to discuss the Arab–Israeli conflict), Reagan sent the California Highway Patrol and other officers to quell the protests. This led to an incident that became known as "Bloody Thursday," resulting in the death of student James Rector and the blinding of carpenter Alan Blanchard. In addition, 111 police officers were injured in the conflict, including one who was knifed in the chest. Reagan then called out 2,200 state National Guard troops to occupy the city of Berkeley for two weeks to crack down on the protesters. The Guard remained in Berkeley for 17 days, camping in People's Park, and demonstrations subsided as the university removed cordoned-off fencing and placed all development plans for People's Park on hold. One year after "Bloody Thursday," Reagan responded to questions about campus protest movements saying, "If it takes a bloodbath, let's get it over with. No more appeasement." When the Symbionese Liberation Army kidnapped Patty Hearst in Berkeley and demanded the distribution of food to the poor, Reagan joked to a group of political aides about a botulism outbreak contaminating the food. Early in 1967, the national debate on abortion was starting to gain traction. In the early stages of the debate, Democratic California state senator Anthony C. Beilenson introduced the "Therapeutic Abortion Act" in an effort to reduce the number of "back-room abortions" performed in California. The state legislature sent the bill to Reagan's desk where, after many days of indecision, he signed it on June 14, 1967. About two million abortions would be performed as a result, mostly because of a provision in the bill allowing abortions for the well-being of the mother. Reagan had been in office for only four months when he signed the bill, and later stated that had he been more experienced as governor, he would not have signed it. After he recognized what he called the "consequences" of the bill, he announced that he was pro-life. He maintained that position later in his political career, writing extensively about abortion. In 1967, Reagan signed the Mulford Act, which repealed a law allowing public carrying of loaded firearms (becoming California Penal Code 12031 and 171(c)). The bill, which was named after Republican assemblyman Don Mulford, garnered national attention after the Black Panthers marched bearing arms upon the California State Capitol to protest it. Despite an unsuccessful attempt to force a recall election on Reagan in 1968, he was re-elected governor in 1970, defeating "Big Daddy" Jesse M. Unruh. He chose not to seek a third term in the following election cycle. One of Reagan's greatest frustrations in office was the controversy of capital punishment, which he strongly supported. His efforts to enforce the state's laws in this area were thwarted when the Supreme Court of California issued its People v. Anderson decision, which invalidated all death sentences issued in California before 1972, though the decision was later overturned by a constitutional amendment. The only execution during Reagan's governorship was on April 12, 1967, when Aaron Mitchell's sentence was carried out by the state in San Quentin's gas chamber. When Reagan was governor in 1969, he signed the Family Law Act, which was an amalgam of two bills that had been written and revised by the California State Legislature over more than two years. It became the first no-fault divorce legislation in the United States. Years later, no-fault divorce became Reagan's greatest regret. Reagan's terms as governor helped to shape the policies he would pursue in his later political career as president. By campaigning on a platform of sending "the welfare bums back to work," he spoke out against the idea of the welfare state. He also strongly advocated the Republican ideal of less government regulation of the economy, including that of undue federal taxation. Reagan did not seek re-election to a third term as governor in 1974; he was succeeded by the Secretary of State, Democrat Jerry Brown, who took office on January 6, 1975. In 1976, Reagan challenged incumbent President Gerald Ford in a bid to become the Republican Party's candidate for president. Reagan soon established himself as the conservative candidate with the support of like-minded organizations such as the American Conservative Union, which became key components of his political base, while Ford was considered a more moderate Republican. Reagan's campaign relied on a strategy crafted by campaign manager John Sears of winning a few primaries early to damage the inevitability of Ford's likely nomination. Reagan won North Carolina, Texas, and California, but the strategy failed, as he ended up losing New Hampshire, Florida, and his native Illinois. The Texas campaign lent renewed hope to Reagan, when he swept all 96 delegates chosen in the May 1 primary, with four more awaiting at the state convention. Much of the credit for that victory came from the work of three co-chairmen, including Ernest Angelo, the mayor of Midland, and Ray Barnhart of Houston, whom Reagan as President would appoint in 1981 as director of the Federal Highway Administration. However, as the GOP convention neared, Ford appeared close to victory. Acknowledging his party's moderate wing, Reagan chose moderate Senator Richard Schweiker of Pennsylvania as his running mate if nominated. Nonetheless, Ford prevailed with 1,187 delegates to Reagan's 1,070. Ford would go on to lose the 1976 presidential election to the Democratic nominee, Jimmy Carter. After the campaign, Reagan remained in the public debate with the Ronald Reagan Radio Commentary series and his political action committee, Citizens for the Republic, which was later revived in Alexandria, Virginia, in 2009 by the Reagan biographer Craig Shirley. The 1980 presidential election featured Reagan against incumbent President Jimmy Carter and was conducted amid a multitude of domestic concerns as well as the ongoing Iran hostage crisis. Reagan's campaign stressed some of his fundamental principles: lower taxes to stimulate the economy, less government interference in people's lives, states' rights, and a strong national defense. Reagan launched his campaign by declaring "I believe in states' rights." After receiving the Republican nomination, Reagan selected one of his opponents in the primaries, George H. W. Bush, to be his running mate. His relaxed and confident appearance during the televised Reagan-Carter debate on October 28, boosted his popularity, and helped to widen his lead in the polls. On November 4, Reagan won a decisive victory over Carter, carrying 44 states and receiving 489 electoral votes, to Carter's 49 electoral votes from six states plus the District of Columbia. He won the popular vote by a more modest margin, receiving 50.7% to Carter's 41.0%, with independent John B. Anderson garnering 6.6%. Additionally, Republicans won a majority of seats in the Senate for the first time since 1952, and gained 34 House seats, but the Democrats retained a majority. During his presidency, Reagan pursued policies that reflected his personal belief in individual freedom; brought changes domestically, both to the U.S. economy and expanded military; and contributed to the end of the Cold War. Termed the "Reagan Revolution," his presidency would reinvigorate American morale, reinvigorate the U.S. economy and reduce reliance upon government. As president, Reagan kept a diary in which he commented on daily occurrences of his presidency and his views on the issues of the day. The diaries were published in May 2007 in the bestselling book, The Reagan Diaries. Ronald Reagan was 69 years old when he was sworn into office for his first term on January 20, 1981. In his inaugural address (which Reagan himself wrote), he addressed the country's economic malaise, arguing: "In this present crisis, government is not the solution to our problems; government is the problem." In 1981, Reagan became the first president to propose a constitutional amendment on school prayer. Reagan's election reflected an opposition to the 1962 Supreme Court case Engel v. Vitale, prohibiting state officials from composing an official state prayer and requiring that it be recited in the public schools. Reagan's 1981 proposed amendment stated: "Nothing in this Constitution shall be construed to prohibit individual or group prayer in public schools or other public institutions. No person shall be required by the United States or by any state to participate in prayer." In 1984, Reagan again raised the issue, asking Congress "why can't [the] freedom to acknowledge God be enjoyed again by children in every schoolroom across this land?" In 1985, Reagan expressed his disappointment that the Supreme Court ruling still bans a moment of silence for public schools, and said he had "an uphill battle." In 1987 Reagan renewed his call for Congress to support voluntary prayer in schools and end "the expulsion of God from America's classrooms." Critics argue that any governmental imposition of prayer on public school students is involuntary. No Supreme Court rulings suggest that students cannot engage in silent prayer on their own. During his term in office, Reagan campaigned vigorously to restore organized prayer to the schools, first as a moment of prayer and later as a Moment of Silence. On March 30, 1981 (shortly into his new administration), Reagan, his press secretary James Brady, Washington police officer Thomas Delahanty, and Secret Service agent Tim McCarthy were struck by gunfire from would-be assassin John Hinckley Jr. outside the Washington Hilton hotel. Although "close to death" upon arrival at George Washington University Hospital, Reagan was stabilized in the emergency room, then underwent emergency exploratory surgery. He recovered and was released from the hospital on April 11, becoming the first serving U.S. president to survive being shot in an assassination attempt. The attempt had great influence on Reagan's popularity; polls indicated his approval rating to be around 73%. Reagan believed that God had spared his life so that he might go on to fulfill a greater purpose. In August 1981, PATCO, the union of federal air traffic controllers, went on strike, violating a federal law prohibiting government unions from striking. Declaring the situation an emergency as described in the 1947 Taft–Hartley Act, Reagan stated that if the air traffic controllers "do not report for work within 48 hours, they have forfeited their jobs and will be terminated." They did not return, and on August 5, Reagan fired 11,345 striking air traffic controllers who had ignored his order, and used supervisors and military controllers to handle the nation's commercial air traffic until new controllers could be hired and trained. A leading reference work on public administration concluded, "The firing of PATCO employees not only demonstrated a clear resolve by the president to take control of the bureaucracy, but it also sent a clear message to the private sector that unions no longer needed to be feared." During Jimmy Carter's last year in office (1980), inflation averaged 12.5%, compared with 4.4% during Reagan's last year in office (1988). During Reagan's administration, the unemployment rate declined from 7.5% to 5.4%, with the rate reaching highs of 10.8% in 1982 and 10.4% in 1983, averaging 7.5% over the eight years, and real GDP growth averaged 3.4% with a high of 8.6% in 1983, while nominal GDP growth averaged 7.4%, and peaked at 12.2% in 1982. Reagan implemented policies based on supply-side economics, advocating a laissez-faire philosophy and free-market fiscal policy, seeking to stimulate the economy with large, across-the-board tax cuts. He also supported returning the United States to some sort of gold standard, and successfully urged Congress to establish the U.S. Gold Commission to study how one could be implemented. Citing the economic theories of Arthur Laffer, Reagan promoted the proposed tax cuts as potentially stimulating the economy enough to expand the tax base, offsetting the revenue loss due to reduced rates of taxation, a theory that entered political discussion as the Laffer curve. Reaganomics was the subject of debate with supporters pointing to improvements in certain key economic indicators as evidence of success, and critics pointing to large increases in federal budget deficits and the national debt. His policy of "peace through strength" resulted in a record peacetime defense buildup including a 40% real increase in defense spending between 1981 and 1985. During Reagan's presidency, federal income tax rates were lowered significantly with the signing of the Economic Recovery Tax Act of 1981, which lowered the top marginal tax bracket from 70% to 50% and the lowest bracket from 14% to 11%. Other tax increases passed by Congress and signed by Reagan ensured however that tax revenues over his two terms were 18.2% of GDP as compared to 18.1% over the 40-year period of 1970–2010. Then, in 1982 the Job Training Partnership Act of 1982 was signed into law, initiating one of the United States' first public–private partnerships and a major part of the president's job creation program. Reagan's Assistant Secretary of Labor and Chief of Staff, Al Angrisani, was a primary architect of the bill. Conversely, Congress passed and Reagan signed into law tax increases of some nature in every year from 1981 to 1987 to continue funding such government programs as Tax Equity and Fiscal Responsibility Act of 1982 (TEFRA), Social Security, and the Deficit Reduction Act of 1984 (DEFRA). TEFRA was the "largest peacetime tax increase in American history." Gross domestic product (GDP) growth recovered strongly after the early 1980s recession ended in 1982, and grew during his eight years in office at an annual rate of 7.9% per year, with a high of 12.2% growth in 1981. Unemployment peaked at 10.8% monthly rate in December 1982—higher than any time since the Great Depression—then dropped during the rest of Reagan's presidency. Sixteen million new jobs were created, while inflation significantly decreased. The Tax Reform Act of 1986, another bipartisan effort championed by Reagan, simplified the tax code by reducing the number of tax brackets to four and slashing a number of tax breaks. The top rate was dropped to 28%, but capital gains taxes were increased on those with the highest incomes from 20% to 28%. The increase of the lowest tax bracket from 11% to 15% was more than offset by expansion of the personal exemption, standard deduction, and earned income tax credit. The net result was the removal of six million poor Americans from the income tax roll and a reduction of income tax liability at all income levels. The net effect of all Reagan-era tax bills was a 1% decrease in government revenues when compared to Treasury Department revenue estimates from the Administration's first post-enactment January budgets. However, federal income tax receipts increased from 1980 to 1989, rising from $308.7 billion to $549 billion or an average annual rate of 8.2% (2.5% attributed to higher Social Security receipts), and federal outlays grew at an annual rate of 7.1%. Reagan's policies proposed that economic growth would occur when marginal tax rates were low enough to spur investment, which would then lead to higher employment and wages. Critics labeled this "trickle-down economics"—the belief that tax policies that benefit the wealthy will create a "trickle-down" effect to the poor. Questions arose whether Reagan's policies benefited the wealthy more than those living in poverty, and many poor and minority citizens viewed Reagan as indifferent to their struggles. These views were exacerbated by the fact that Reagan's economic regimen included freezing the minimum wage at $3.35 an hour, slashing federal assistance to local governments by 60%, cutting the budget for public housing and Section 8 rent subsidies in half, and eliminating the antipoverty Community Development Block Grant program. The widening gap between the rich and poor had already begun during the 1970s before Reagan's economic policies took effect. Along with Reagan's 1981 cut in the top regular tax rate on unearned income, he reduced the maximum capital gains rate to 20%. Reagan later set tax rates on capital gains at the same level as the rates on ordinary income like salaries and wages, with both topping out at 28%. Reagan is viewed as an antitax hero despite raising taxes eleven times over the course of his presidency, all in the name of fiscal responsibility. According to Paul Krugman, "Over all, the 1982 tax increase undid about a third of the 1981 cut; as a share of GDP, the increase was substantially larger than Mr. Clinton's 1993 tax increase." According to historian and domestic policy adviser Bruce Bartlett, Reagan's tax increases over the course of his presidency took back half of the 1981 tax cut. Reagan was opposed to government intervention, and he cut the budgets of non-military programs including Medicaid, food stamps, federal education programs and the EPA. He protected entitlement programs such as Social Security and Medicare, but his administration attempted to purge many people with disabilities from the Social Security disability rolls. The administration's stance toward the savings and loan industry contributed to the savings and loan crisis. A minority of the critics of Reaganomics also suggested that the policies partially influenced the stock market crash of 1987, but there is no consensus regarding a single source for the crash. In order to cover newly spawned federal budget deficits, the United States borrowed heavily both domestically and abroad, raising the national debt from $997 billion to $2.85 trillion. Reagan described the new debt as the "greatest disappointment" of his presidency. He reappointed Paul Volcker as Chairman of the Federal Reserve, and in 1987 he appointed monetarist Alan Greenspan to succeed him. Reagan ended the price controls on domestic oil that had contributed to the energy crises of 1973–74 and the summer of 1979. The price of oil subsequently dropped, and there were no fuel shortages like those in the 1970s. Reagan also fulfilled a 1980 campaign promise to repeal the windfall profits tax in 1988, which had previously increased dependence on foreign oil. Some economists, such as Nobel Prize winners Milton Friedman and Robert Mundell, argue that Reagan's tax policies invigorated America's economy and contributed to the economic boom of the 1990s. Other economists, such as Nobel Prize winner Robert Solow, argue that Reagan's deficits were a major reason his successor, George H. W. Bush, reneged on his campaign promise and resorted to raising taxes. During Reagan's presidency, a program was initiated within the United States Intelligence Community to ensure America's economic strength. The program, Project Socrates, developed and demonstrated the means required for the United States to generate and lead the next evolutionary leap in technology acquisition and utilization for a competitive advantage—automated innovation. To ensure that the United States acquired the maximum benefit from automated innovation, Reagan, during his second term, had an executive order drafted to create a new federal agency to implement the Project Socrates results on a nationwide basis. However, Reagan's term came to end before the executive order could be coordinated and signed, and the incoming Bush administration, labeling Project Socrates as "industrial policy," had it terminated. The Reagan administration was often criticized for inadequately enforcing, if not actively undermining, civil rights legislation. In 1982, he signed a bill extending the Voting Rights Act for 25 years after a grass-roots lobbying and legislative campaign forced him to abandon his plan to ease that law's restrictions. He also signed legislation establishing a federal Martin Luther King holiday, though he did so with reservations. In 1988, he vetoed the Civil Rights Restoration Act, but his veto was overridden by Congress. Reagan had argued that the legislation infringed on states' rights and the rights of churches and business owners. Reagan escalated the Cold War, accelerating a reversal from the policy of détente that began during the Carter Administration, following the Afghan Saur Revolution and subsequent Soviet invasion. He ordered a massive buildup of the United States Armed Forces and implemented new policies that were directed towards the Soviet Union; he revived the B-1 Lancer program that had been canceled by the Carter administration, and he produced the MX missile. In response to Soviet deployment of the SS-20, Reagan oversaw NATO's deployment of the Pershing missile in West Germany. In 1982 Reagan tried to cut off Moscow's access to hard currency by impeding its proposed gas line to Western Europe. It hurt the Soviet economy, but it also caused ill will among American allies in Europe who counted on that revenue. Reagan retreated on this issue. Their society is economically weak, and it lacks the wealth, education, and technology to enter the information age. They have thrown everything into military production, and their society is starting to show terrible stress as a result. They can't sustain military production the way we can. Eventually it will break them, and then there will be just one superpower in a safe world—if, only if, we can keep spending. Lemann noted that when he wrote that in 1984, he thought the Reaganites were living in a fantasy world. But by 2016, Lemann stated that the passage represents "a fairly uncontroversial description of what Reagan actually did." Reagan and the United Kingdom's prime minister Margaret Thatcher both denounced the Soviet Union in ideological terms. In a famous address on June 8, 1982, to the Parliament of the United Kingdom in the Royal Gallery of the Palace of Westminster, Reagan said, "the forward march of freedom and democracy will leave Marxism–Leninism on the ash heap of history." On March 3, 1983, he predicted that communism would collapse, stating, "Communism is another sad, bizarre chapter in human history whose last pages even now are being written." In a speech to the National Association of Evangelicals on March 8, 1983, Reagan called the Soviet Union "an evil empire." After Soviet fighters downed Korean Air Lines Flight 007 near Moneron Island on September 1, 1983, carrying 269 people, including Georgia congressman Larry McDonald, Reagan labeled the act a "massacre" and declared that the Soviets had turned "against the world and the moral precepts which guide human relations among people everywhere." The Reagan administration responded to the incident by suspending all Soviet passenger air service to the United States, and dropped several agreements being negotiated with the Soviets, wounding them financially. As a result of the shootdown, and the cause of KAL 007's going astray thought to be inadequacies related to its navigational system, Reagan announced on September 16, 1983, that the Global Positioning System would be made available for civilian use, free of charge, once completed in order to avert similar navigational errors in future. Under a policy that came to be known as the Reagan Doctrine, Reagan and his administration also provided overt and covert aid to anti-communist resistance movements in an effort to "rollback" Soviet-backed communist governments in Africa, Asia, and Latin America. However, in a break from the Carter Administration policy of arming Taiwan under the Taiwan Relations Act, Reagan also agreed with the communist government in China to reduce the sale of arms to Taiwan. Reagan with actress Sigourney Weaver and King Fahd of Saudi Arabia in 1985. The U.S. and Saudi Arabia supplied money and arms to the anti-Soviet fighters in Afghanistan. Reagan deployed the CIA's Special Activities Division to Afghanistan and Pakistan. They were instrumental in training, equipping and leading Mujahideen forces against the Soviet Army. President Reagan's Covert Action program has been given credit for assisting in ending the Soviet occupation of Afghanistan, though some of the United States funded armaments introduced then would later pose a threat to U.S. troops in the 2001 War in Afghanistan. The CIA also began sharing information with the Iranian government, which it was secretly courting. In one instance, in 1982, this practice enabled the government to identify and purge communists from its ministries, and to virtually eliminate the pro-Soviet infrastructure in Iran. In March 1983, Reagan introduced the Strategic Defense Initiative, a defense project that would have used ground- and space-based systems to protect the United States from attack by strategic nuclear ballistic missiles. Reagan believed that this defense shield could make nuclear war impossible. There was much disbelief surrounding the program's scientific feasibility, leading opponents to dub SDI "Star Wars" and argue that its technological objective was unattainable. The Soviets became concerned about the possible effects SDI would have; leader Yuri Andropov said it would put "the entire world in jeopardy." For those reasons, David Gergen, former aide to President Reagan, believes that in retrospect, SDI hastened the end of the Cold War. Though supported by leading American conservatives who argued that Reagan's foreign policy strategy was essential to protecting U.S. security interests, critics labeled the administration's foreign policy initiatives as aggressive and imperialistic, and chided them as "warmongering." The administration was also heavily criticized for backing anti-communist leaders accused of severe human rights violations, such as Hissène Habré of Chad and Efraín Ríos Montt of Guatemala. During the 16 months (1982–1983) Montt was President of Guatemala, the Guatemalan military was accused of genocide for massacres of members of the Ixil people and other indigenous groups. Reagan had said that Montt was getting a "bum rap," and described him as "a man of great personal integrity." Previous human rights violations had prompted the United States to cut off aid to the Guatemalan government, but the Reagan administration appealed to Congress to restart military aid. Although unsuccessful with that, the administration was successful in providing nonmilitary assistance such as USAID. With the approval of Congress, Reagan sent forces to Lebanon in 1983 to reduce the threat of the Lebanese Civil War. The American peacekeeping forces in Beirut, a part of a multinational force during the Lebanese Civil War, were attacked on October 23, 1983. The Beirut barracks bombing killed 241 American servicemen and wounded more than 60 others by a suicide truck bomber. Reagan sent in the USS New Jersey battleship to shell Syrian positions in Lebanon. He then withdrew all the Marines from Lebanon. On October 25, 1983, Reagan ordered U.S. forces to invade Grenada (codenamed "Operation Urgent Fury") where a 1979 coup d'état had established an independent non-aligned Marxist–Leninist government. A formal appeal from the Organisation of Eastern Caribbean States (OECS) led to the intervention of U.S. forces; President Reagan also cited an allegedly regional threat posed by a Soviet-Cuban military build-up in the Caribbean and concern for the safety of several hundred American medical students at St. George's University as adequate reasons to invade. Operation Urgent Fury was the first major military operation conducted by U.S. forces since the Vietnam War, several days of fighting commenced, resulting in a U.S. victory, with 19 American fatalities and 116 wounded American soldiers. In mid-December, after a new government was appointed by the governor-general, U.S. forces withdrew. Reagan accepted the Republican nomination in the Republican convention in Dallas, Texas. 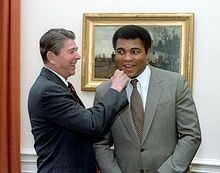 He proclaimed that it was "morning again in America," regarding the recovering economy and the dominating performance by the American athletes at the 1984 Summer Olympics on home soil, among other things. He became the first U.S. president to open an Olympic Games. Previous Olympics taking place in the United States had been opened by either the Vice President (three times) or another person in charge (twice). Reagan's opponent in the 1984 presidential election was former Vice President Walter Mondale. With questions about Reagan's age, and a weak performance in the first presidential debate, his ability to perform the duties of president for another term was questioned. His apparent confused and forgetful behavior was evident to his supporters; they had previously known him clever and witty. Rumors began to circulate that he had Alzheimer's disease. Reagan rebounded in the second debate, and confronted questions about his age, quipping, "I will not make age an issue of this campaign. I am not going to exploit, for political purposes, my opponent's youth and inexperience," which generated applause and laughter, even from Mondale himself. That November, Reagan won a landslide re-election victory, carrying 49 of the 50 states, while Mondale won only Minnesota, his home state, and the District of Columbia. Reagan won 525 of the 538 electoral votes, the most of any presidential candidate in U.S. history, and also received 58.8% of the popular vote to Mondale's 40.6%. His popular vote margin of victory, nearly 16.9 million votes (54.4 million for Reagan to 37.5 million for Mondale), was exceeded only by Richard Nixon in his 1972 victory over George McGovern. Reagan was sworn in as president for the second time on January 20, 1985, in a private ceremony at the White House. To date, at 73 years of age, he is the oldest person to take the presidential oath of office. Because January 20 fell on a Sunday, a public celebration was not held but took place in the Capitol rotunda the following day. January 21 was one of the coldest days on record in Washington, D.C.; due to poor weather, inaugural celebrations were held inside the Capitol. In the weeks that followed, he shook up his staff somewhat, moving White House Chief of Staff James Baker to Secretary of the Treasury and naming Treasury Secretary Donald Regan, a former Merrill Lynch officer, Chief of Staff. In 1988, near the end of the Iran–Iraq War, the U.S. Navy guided missile cruiser USS Vincennes accidentally shot down Iran Air Flight 655 killing 290 civilian passengers. The incident further worsened already tense Iran–United States relations. Major international criticism followed Reagan in 1985 when he was accused of honoring Nazi war criminals at a cemetery in West Germany. In February 1985, the administration accepted an invitation for Reagan to visit a German military cemetery in Bitburg and to place a wreath alongside West German Chancellor Helmut Kohl. Deaver was given assurances by a German head of protocol that no war criminals were buried there. It was later determined that the cemetery held the graves of 49 members of the Waffen-SS. What neither Deaver nor other administration officials initially realized was that many Germans drew a distinction between the regular SS, who typically were composed of Nazi true believers, and the Waffen-SS which were attached to military units and composed of conscripted soldiers. As the controversy brewed in April 1985, Reagan issued a statement that called the Nazi soldiers buried in that cemetery as themselves "victims," a designation which ignited a stir over whether Reagan had equated the SS men to victims of the Holocaust. Pat Buchanan, Reagan's Director of Communications, argued that the president did not equate the SS members with the actual Holocaust, but as victims of the ideology of Nazism. Now strongly urged to cancel the visit, the president responded that it would be wrong to back down on a promise he had made to Chancellor Kohl. On May 5, 1985, President Reagan and Chancellor Kohl first visited the site of the former Nazi Bergen-Belsen concentration camp and then the Bitburg cemetery where, along with two military generals, they did place a wreath. In response to concerns about the increasing crack epidemic, Reagan began the War on Drugs campaign in 1982, a policy led by the federal government to reduce the illegal drug trade. Though Nixon had previously declared a war on drugs, Reagan advocated more militant policies. He said that "drugs were menacing our society" and promised to fight for drug-free schools and workplaces, expanded drug treatment, stronger law enforcement and drug interdiction efforts, and greater public awareness. In 1986, Reagan signed a drug enforcement bill that budgeted $1.7 billion (equivalent to $3.9 billion in 2018) to fund the War on Drugs and specified a mandatory minimum penalty for drug offenses. The bill was criticized for promoting significant racial disparities in the prison population, and critics also charged that the policies did little to reduce the availability of drugs on the street, while resulting in a great financial burden for America. Defenders of the effort point to success in reducing rates of adolescent drug use: marijuana use among high-school seniors declined from 33% in 1980 to 12% in 1991. First Lady Nancy Reagan made the War on Drugs her main priority by founding the "Just Say No" drug awareness campaign, which aimed to discourage children and teenagers from engaging in recreational drug use by offering various ways of saying "no." Nancy Reagan traveled to 65 cities in 33 states, raising awareness about the dangers of drugs including alcohol. According to AIDS activist organizations such as ACT UP, the Reagan administration largely ignored the AIDS crisis, which began to unfold in the United States in 1981, the same year Reagan took office. They also claim AIDS research was chronically underfunded during Reagan's administration, and requests for more funding by doctors at the Centers for Disease Control (CDC) were routinely denied. By the time President Reagan had given his first prepared speech on the epidemic, some six years into his presidency, 36,058 Americans had been diagnosed with AIDS and 20,849 had died of it. By the end of 1989, the year Reagan left office, 115,786 people had been diagnosed with AIDS in the United States, and more than 70,000 of them had died of it. Others, however, point out that federal funding for AIDS-related programs was $2.3 billion in 1989 and nearly $6 billion total over his presidency. In a September 1985 press conference Reagan said: "this is a top priority with us...there's no question about the seriousness of this and the need to find an answer." Gary Bauer, who was Reagan's domestic policy adviser near the end of his second term, similarly argued that Reagan's belief in cabinet government led him to assign the job of speaking out against AIDS to his Surgeon General and Secretary of Health and Human Services. Relations between Libya and the United States under President Reagan were continually contentious, beginning with the Gulf of Sidra incident in 1981; by 1982, Libyan leader Muammar Gaddafi was considered by the CIA to be, along with USSR leader Leonid Brezhnev and Cuban leader Fidel Castro, part of a group known as the "unholy trinity" and was also labeled as "our international public enemy number one" by a CIA official. These tensions were later revived in early April 1986, when a bomb exploded in a Berlin discothèque, resulting in the injury of 63 American military personnel and death of one serviceman. Stating that there was "irrefutable proof" that Libya had directed the "terrorist bombing," Reagan authorized the use of force against the country. In the late evening of April 15, 1986, the United States launched a series of airstrikes on ground targets in Libya. Britain's prime minister, Margaret Thatcher, allowed the U.S. Air Force to use Britain's air bases to launch the attack, on the justification that the UK was supporting America's right to self-defense under Article 51 of the United Nations Charter. The attack was designed to halt Gaddafi's "ability to export terrorism," offering him "incentives and reasons to alter his criminal behavior." The president addressed the nation from the Oval Office after the attacks had commenced, stating, "When our citizens are attacked or abused anywhere in the world on the direct orders of hostile regimes, we will respond so long as I'm in this office." The attack was condemned by many countries. By a vote of 79 in favor to 28 against with 33 abstentions, the United Nations General Assembly adopted resolution 41/38 which "condemns the military attack perpetrated against the Socialist People's Libyan Arab Jamahiriya on April 15, 1986, which constitutes a violation of the Charter of the United Nations and of international law." Reagan signed the Immigration Reform and Control Act in 1986. The act made it illegal to knowingly hire or recruit illegal immigrants, required employers to attest to their employees' immigration status, and granted amnesty to approximately three million illegal immigrants who entered the United States before January 1, 1982, and had lived in the country continuously. Critics argue that the employer sanctions were without teeth and failed to stem illegal immigration. Upon signing the act at a ceremony held beside the newly refurbished Statue of Liberty, Reagan said, "The legalization provisions in this act will go far to improve the lives of a class of individuals who now must hide in the shadows, without access to many of the benefits of a free and open society. Very soon many of these men and women will be able to step into the sunlight and, ultimately, if they choose, they may become Americans." Reagan also said, "The employer sanctions program is the keystone and major element. It will remove the incentive for illegal immigration by eliminating the job opportunities which draw illegal aliens here." In 1986, the Iran–Contra affair became a problem for the administration stemming from the use of proceeds from covert arms sales to Iran during the Iran–Iraq War to fund the Contra rebels fighting against the government in Nicaragua, which had been specifically outlawed by an act of Congress. The affair became a political scandal in the United States during the 1980s. The International Court of Justice, whose jurisdiction to decide the case was disputed by the United States, ruled that the United States had violated international law and breached treaties in Nicaragua in various ways. President Reagan professed that he was unaware of the plot's existence. He opened his own investigation and appointed two Republicans and one Democrat, John Tower, Brent Scowcroft and Edmund Muskie, respectively, to investigate the scandal. The commission could not find direct evidence that Reagan had prior knowledge of the program, but criticized him heavily for his disengagement from managing his staff, making the diversion of funds possible. A separate report by Congress concluded that "If the president did not know what his national security advisers were doing, he should have." Reagan's popularity declined from 67% to 46% in less than a week, the greatest and quickest decline ever for a president. The scandal resulted in fourteen indictments within Reagan's staff, and eleven convictions. Many Central Americans criticize Reagan for his support of the Contras, calling him an anti-communist zealot, blinded to human rights abuses, while others say he "saved Central America." Daniel Ortega, Sandinistan and president of Nicaragua, said that he hoped God would forgive Reagan for his "dirty war against Nicaragua." Until the early 1980s, the United States had relied on the qualitative superiority of its weapons to essentially frighten the Soviets, but the gap had been narrowed. Although the Soviet Union did not accelerate military spending after President Reagan's military buildup, their large military expenses, in combination with collectivized agriculture and inefficient planned manufacturing, were a heavy burden for the Soviet economy. At the same time, oil prices in 1985 fell to one-third of the previous level; oil was the main source of Soviet export revenues. These factors contributed to a stagnant Soviet economy during Gorbachev's tenure. Reagan was deeply committed first to the abolition of nuclear weapons, worldwide. Second, he was committed (thanks to his California friend Edward Teller, the father of the hydrogen bomb) to building a defense against nuclear weapons, called the Strategic Defense Initiative (SDI, nicknamed "Star Wars"). American scientists were not sure that SDI would work, but they were sure its total cost would reach in the trillions of dollars. Reagan encouraged Congress to think of it as billions of new dollars spent in individual districts. If SDI worked, thousands of Soviet nuclear-armed missiles would be worthless — if launched, they could all be shot down. Gorbachev made it his highest priority to get Reagan to abandon SDI. Meanwhile, Reagan escalated the rhetoric. In his famous 1983 speech to religious fundamentalists he outlined his strategy for victory. First, he labeled the Soviet system an "Evil empire" and a failure—its demise would be a godsend for the world. Second, Reagan explained his strategy was an arms buildup that would leave the Soviets far behind, with no choice but to negotiate arms reduction. Finally, displaying his characteristic optimism, he praised liberal democracy and promised that such a system eventually would triumph over Soviet communism. Reagan appreciated the revolutionary change in the direction of the Soviet policy with Mikhail Gorbachev, and shifted to diplomacy, with a view to encourage the Soviet leader to pursue substantial arms agreements. He and Gorbachev held four summit conferences between 1985 and 1988: the first in Geneva, Switzerland, the second in Reykjavík, Iceland, the third in Washington, D.C., and the fourth in Moscow. Reagan believed that if he could persuade the Soviets to allow for more democracy and free speech, this would lead to reform and the end of Communism. The critical summit was at Reykjavík in October 1986, where they met alone, with translators but with no aides. To the astonishment of the world, and the chagrin of Reagan's most conservative supporters, they agreed to abolish all nuclear weapons. Gorbachev then asked the end of SDI. Reagan said no, claiming that it was defensive only, and that he would share the secrets with the Soviets. No deal was achieved. Speaking at the Berlin Wall on June 12, 1987, Reagan challenged Gorbachev to go further, saying "General Secretary Gorbachev, if you seek peace, if you seek prosperity for the Soviet Union and Eastern Europe, if you seek liberalization, come here to this gate! Mr. Gorbachev, open this gate! Mr. Gorbachev, tear down this wall!" At Gorbachev's visit to Washington in December 1987, he and Reagan signed the Intermediate-Range Nuclear Forces Treaty (INF Treaty) at the White House, which eliminated an entire class of nuclear weapons. The two leaders laid the framework for the Strategic Arms Reduction Treaty, or START I; Reagan insisted that the name of the treaty be changed from Strategic Arms Limitation Talks to Strategic Arms Reduction Talks. When Reagan visited Moscow for the fourth summit in 1988, he was viewed as a celebrity by the Soviets. A journalist asked the president if he still considered the Soviet Union the evil empire. "No," he replied, "I was talking about another time, another era." At Gorbachev's request, Reagan gave a speech on free markets at the Moscow State University. Early in his presidency, Reagan started wearing a custom-made, technologically advanced hearing aid, first in his right ear and later in his left ear as well. His decision to go public in 1983 regarding his wearing the small, audio-amplifying device boosted their sales. On July 13, 1985, Reagan underwent surgery at Bethesda Naval Hospital to remove cancerous polyps from his colon. He relinquished presidential power to the Vice President for eight hours in a similar procedure as outlined in the 25th Amendment, which he specifically avoided invoking. The surgery lasted just under three hours and was successful. Reagan resumed the powers of the presidency later that day. In August of that year, he underwent an operation to remove skin cancer cells from his nose. In October, more skin cancer cells were detected on his nose and removed. In January 1987, Reagan underwent surgery for an enlarged prostate that caused further worries about his health. No cancerous growths were found and he was not sedated during the operation. In July of that year, aged 76, he underwent a third skin cancer operation on his nose. On January 7, 1989, Reagan underwent surgery at Walter Reed Army Medical Center to repair a Dupuytren's contracture of the ring finger of his left hand. The surgery lasted for more than three hours and was performed under regional anesthesia. This procedure was done just thirteen days before he left office. For this reason, he had a hand and finger bandage the day of his farewell speech and the day of the inauguration of George H. W. Bush. During his 1980 campaign, Reagan pledged that he would appoint the first female Supreme Court Justice if given the opportunity. That opportunity came in his first year in office when he nominated Sandra Day O'Connor to fill the vacancy created by the retirement of Justice Potter Stewart. In his second term, Reagan elevated William Rehnquist to succeed Warren E. Burger as Chief Justice, and named Antonin Scalia to fill the vacant seat. Reagan nominated conservative jurist Robert Bork to the high court in 1987. Senator Ted Kennedy, a Democrat of Massachusetts, strongly condemned Bork, and great controversy ensued. Bork's nomination was rejected 58–42. Reagan then nominated Douglas Ginsburg, but Ginsburg withdrew his name from consideration after coming under fire for his cannabis use. Anthony Kennedy was eventually confirmed in his place. Along with his three Supreme Court appointments, Reagan appointed 83 judges to the United States courts of appeals, and 290 judges to the United States district courts. Early in his tenure, Reagan appointed Clarence M. Pendleton Jr., of San Diego as the first African American to chair the United States Commission on Civil Rights. Pendleton tried to steer the commission into a conservative direction in line with Reagan's views on social and civil rights policy during his tenure from 1981 until his sudden death in 1988. Pendleton soon aroused the ire of many civil rights advocates and feminists when he ridiculed the comparable worth proposal as being "Looney Tunes." 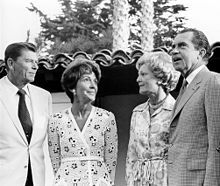 After leaving office in 1989, the Reagans purchased a home in Bel Air, Los Angeles, in addition to the Reagan Ranch in Santa Barbara. They regularly attended Bel Air Church and occasionally made appearances on behalf of the Republican Party; Reagan delivered a well-received speech at the 1992 Republican National Convention. Previously, on November 4, 1991, the Ronald Reagan Presidential Library was dedicated and opened to the public. Five presidents and six first ladies attended the dedication ceremonies, marking the first time that five presidents were gathered in the same location. Reagan continued to speak publicly in favor of a line-item veto; the Brady Bill; a constitutional amendment requiring a balanced budget; and the repeal of the 22nd Amendment, which prohibits anyone from serving more than two terms as president. 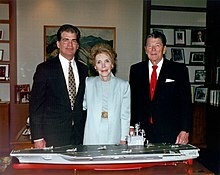 In 1992 Reagan established the Ronald Reagan Freedom Award with the newly formed Ronald Reagan Presidential Foundation. His final public speech occurred on February 3, 1994, during a tribute to him in Washington, D.C.; his last major public appearance was at the funeral of Richard Nixon on April 27, 1994. I have recently been told that I am one of the millions of Americans who will be afflicted with Alzheimer's Disease ... At the moment I feel just fine. I intend to live the remainder of the years God gives me on this earth doing the things I have always done ... I now begin the journey that will lead me into the sunset of my life. I know that for America there will always be a bright dawn ahead. Thank you, my friends. May God always bless you. After his diagnosis, letters of support from well-wishers poured into his California home. But there was also speculation over how long Reagan had demonstrated symptoms of mental degeneration. Not long after the attempted assassination of Ronald Reagan, at a reception for mayors, Reagan greeted his Secretary of Housing and Urban Development Samuel Pierce in 1981 by saying "How are you, Mr Mayor? How are things in your city? ", although he later realized his mistake. In a 2011 book, Reagan's son Ron said he had suspected early signs of his father's dementia as early as 1984. Former CBS White House correspondent Lesley Stahl recounted that in her final meeting with the president in 1986, Reagan did not seem to know who Stahl was. Stahl came close to reporting that Reagan was senile, but at the end of the meeting, he had regained his alertness. However, Dr. Lawrence K. Altman, a physician employed as a reporter for The New York Times, noted that "the line between mere forgetfulness and the beginning of Alzheimer's can be fuzzy," and all four of Reagan's White House doctors said that they saw no evidence of Alzheimer's while he was president. Dr. John E. Hutton, Reagan's primary physician from 1984 to 1989, said the president "absolutely" did not "show any signs of dementia or Alzheimer's." His former Chief of Staff James Baker considered "ludicrous" the idea that Reagan slept during cabinet meetings. Other staff members, former aides, and friends said they saw no indication of Alzheimer's while he was president. Reagan did experience occasional memory lapses, though, especially with names. Reagan's doctors say that he only began exhibiting overt symptoms of the illness in late 1992 or 1993, several years after he had left office. For example, Reagan repeated a toast to Margaret Thatcher, with identical words and gestures, at his 82nd-birthday party on February 6, 1993. Complicating the picture, Reagan suffered an episode of head trauma in July 1989, five years before his diagnosis. After being thrown from a horse in Mexico, a subdural hematoma was found and surgically treated later in the year. Nancy Reagan, citing what doctors told her, asserted that her husband's 1989 fall hastened the onset of Alzheimer's disease, although acute brain injury has not been conclusively proven to accelerate Alzheimer's or dementia. Reagan's one-time physician Daniel Ruge has said it is possible, but not certain, that the horse accident affected the course of Reagan's memory. Reagan suffered a fall at his Bel Air home on January 13, 2001, resulting in a broken hip. The fracture was repaired the following day, and the 89-year-old Reagan returned home later that week, although he faced difficult physical therapy at home. On February 6, 2001, Reagan reached the age of 90, becoming the third former president to do so (the other two being John Adams and Herbert Hoover, with Gerald Ford, George H. W. Bush and Jimmy Carter later surpassing 90). 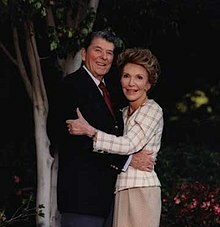 Reagan's public appearances became much less frequent with the progression of the disease, and as a result, his family decided that he would live in quiet semi-isolation with his wife Nancy. She told CNN's Larry King in 2001 that very few visitors were allowed to see her husband because she felt that "Ronnie would want people to remember him as he was." After her husband's diagnosis and death, Nancy Reagan became a stem-cell research advocate, urging Congress and President George W. Bush to support federal funding for embryonic stem-cell research, something Bush opposed. In 2009, she praised President Barack Obama for lifting restrictions on such research. Nancy Reagan said that she believed it could lead to a cure for Alzheimer's. Reagan died of pneumonia, complicated by Alzheimer's disease, at his home in the Bel Air district of Los Angeles, California, on the afternoon of June 5, 2004. A short time after his death, Nancy Reagan released a statement saying, "My family and I would like the world to know that President Ronald Reagan has died after 10 years of Alzheimer's disease at 93 years of age. We appreciate everyone's prayers." President George W. Bush declared June 11 a National Day of Mourning, and international tributes came in from around the world. Reagan's body was taken to the Kingsley and Gates Funeral Home in Santa Monica, California later in the day, where well-wishers paid tribute by laying flowers and American flags in the grass. On June 7, his body was removed and taken to the Ronald Reagan Presidential Library, where a brief family funeral, conducted by Pastor Michael Wenning, was held. Reagan's body lay in repose in the Library lobby until June 9; over 100,000 people viewed the coffin. On June 9, Reagan's body was flown to Washington, D.C., where he became the tenth U.S. president to lie in state in the Rotunda of the U.S. Capitol; in thirty-four hours, 104,684 people filed past the coffin. 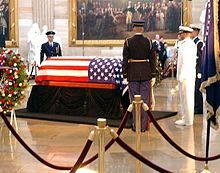 On June 11, a state funeral was conducted in the Washington National Cathedral, presided over by President George W. Bush. Eulogies were given by former British Prime Minister Margaret Thatcher, former Canadian Prime Minister Brian Mulroney, and both former President George H. W. Bush and President George W. Bush. Also in attendance were Mikhail Gorbachev and many world leaders, including British Prime Minister Tony Blair; Prince Charles, representing his mother Queen Elizabeth II; German Chancellor Gerhard Schröder; Italian Prime Minister Silvio Berlusconi; and interim presidents Hamid Karzai of Afghanistan and Ghazi al-Yawer of Iraq. After the funeral, the Reagan entourage was flown back to the Ronald W. Reagan Presidential Library in Simi Valley, California, where another service was held, and President Reagan was interred. At the time of his death, Reagan was the longest-lived president in U.S. history, having lived 93 years and 120 days (2 years, 8 months, and 23 days longer than John Adams, whose record he surpassed). He was also the first U.S. president to die in the 21st century. Reagan's burial site is inscribed with the words he delivered at the opening of the Ronald Reagan Presidential Library: "I know in my heart that man is good, that what is right will always eventually triumph and that there is purpose and worth to each and every life." Since Reagan left office in 1989, substantial debate has occurred among scholars, historians, and the general public surrounding his legacy. Supporters have pointed to a more efficient and prosperous economy as a result of Reagan's economic policies, foreign policy triumphs including a peaceful end to the Cold War, and a restoration of American pride and morale. Proponents say that he had an unabated and passionate love for the United States which restored faith in the American Dream, after a decline in American confidence and self-respect under Jimmy Carter's perceived weak leadership, particularly during the Iran hostage crisis, as well as his gloomy, dreary outlook for the future of the United States during the 1980 election. Critics point out that Reagan's economic policies resulted in rising budget deficits, a wider gap in wealth, and an increase in homelessness and that the Iran–Contra affair lowered American credibility. Despite the continuing debate surrounding his legacy, many conservative and liberal scholars agree that Reagan has been the most influential president since Franklin D. Roosevelt, leaving his imprint on American politics, diplomacy, culture, and economics through his effective communication and pragmatic compromising. Since he left office, historians have reached a consensus, as summarized by British historian M. J. Heale, who finds that scholars now concur that Reagan rehabilitated conservatism, turned the nation to the right, practiced a considerably pragmatic conservatism that balanced ideology and the constraints of politics, revived faith in the presidency and in American exceptionalism, and contributed to victory in the Cold War. In 2017 a C-SPAN survey of scholars – most of whom opposed his specific policies – ranked Reagan in terms of leadership in comparison with all 42 presidents. He ranked number nine in international relations. Reagan's major achievement was that the USSR and Communism collapsed, causing the U.S. to become the world's only superpower. His admirers say he won the Cold War. After 40 years of high tension, the USSR pulled back in the last years of Reagan's second term. In 1989 the Kremlin lost control of all its East European satellites. In 1991, Communism was overthrown in the USSR, and on December 26, 1991, the Soviet Union ceased to exist. 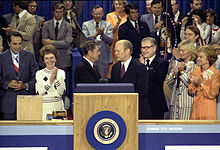 The resulting states were no threat to the U.S. Reagan's exact role is debated, with many believing that Reagan's defense policies, economic policies, military policies and hard line rhetoric against the Soviet Union and Communism, as well as summits with General Secretary Gorbachev played a significant part in ending the Cold War. He was the first president to reject containment and détente and to put into practice the concept that the Soviet Union could be defeated rather than simply negotiated with, a post-Détente strategy, a conviction that was vindicated by Gennadi Gerasimov, the Foreign Ministry spokesman under Gorbachev, who said that the Strategic Defense Initiative was "very successful blackmail. ...The Soviet economy couldn't endure such competition." Reagan's aggressive rhetoric toward the USSR had mixed effects; Jeffery W. Knopf observes that being labeled "evil" probably made no difference to the Soviets but gave encouragement to the East-European citizens opposed to communism. General Secretary Gorbachev said of his former rival's Cold War role: "[He was] a man who was instrumental in bringing about the end of the Cold War," and deemed him "a great president." Gorbachev does not acknowledge a win or loss in the war, but rather a peaceful end; he said he was not intimidated by Reagan's harsh rhetoric. Margaret Thatcher, former Prime Minister of the United Kingdom, said of Reagan, "he warned that the Soviet Union had an insatiable drive for military power... but he also sensed it was being eaten away by systemic failures impossible to reform." She later said, "Ronald Reagan had a higher claim than any other leader to have won the Cold War for liberty and he did it without a shot being fired." Said Brian Mulroney, former Prime Minister of Canada: "He enters history as a strong and dramatic player [in the Cold War]." Former President Lech Wałęsa of Poland acknowledged, "Reagan was one of the world leaders who made a major contribution to communism's collapse." That Reagan had little or no effect in ending the Cold War is argued with equal weight; that Communism's internal weakness had become apparent, and the Soviet Union would have collapsed in the end regardless of who was in power. President Harry S. Truman's policy of containment is also regarded as a force behind the fall of the USSR, and the Soviet invasion of Afghanistan undermined the Soviet system itself. Reagan reshaped the Republican party, led the modern conservative movement, and altered the political dynamic of the United States. More men voted Republican under Reagan, and Reagan tapped into religious voters. The so-called "Reagan Democrats" were a result of his presidency. After leaving office, Reagan became an iconic influence within the Republican party. His policies and beliefs have been frequently invoked by Republican presidential candidates since 1988. The 2008 Republican presidential candidates were no exception, for they aimed to liken themselves to him during the primary debates, even imitating his campaign strategies. Republican nominee John McCain frequently said that he came to office as "a foot soldier in the Reagan Revolution." Reagan's most famous statement regarding the role of smaller government was that "Government is not a solution to our problem, government is the problem." Reagan has become an iconic figure in the Republican Party. Praise for his accomplishments were part of the standard GOP rhetoric a quarter century after his retirement. Washington Post reporter Carlos Lozada noted how the main Republican contenders in the 2016 presidential race adopted "standard GOP Gipper worship." The contenders included even Donald Trump, who had previously been skeptical. The period of American history most dominated by Reagan and his policies that concerned taxes, welfare, defense, the federal judiciary and the Cold War is known today as the Reagan Era. This time period emphasized that the conservative "Reagan Revolution," led by Reagan, had a permanent impact on the United States in domestic and foreign policy. The Bill Clinton administration is often treated as an extension of the Reagan Era, as is the George W. Bush administration. Historian Eric Foner noted that the Obama candidacy in 2008 "aroused a great deal of wishful thinking among those yearning for a change after nearly thirty years of Reaganism." According to columnist Chuck Raasch, "Reagan transformed the American presidency in ways that only a few have been able to." He redefined the political agenda of the times, advocating lower taxes, a conservative economic philosophy, and a stronger military. His role in the Cold War further enhanced his image as a different kind of leader. Reagan's "avuncular style, optimism, and plain-folks demeanor" also helped him turn "government-bashing into an art form." As a sitting president, Reagan did not have the highest approval ratings, but his popularity has increased since 1989. Gallup polls in 2001 and 2007 ranked him number one or number two when correspondents were asked for the greatest president in history. Reagan ranked third of post–World War II presidents in a 2007 Rasmussen Reports poll, fifth in an ABC 2000 poll, ninth in another 2007 Rasmussen poll, and eighth in a late 2008 poll by British newspaper The Times. In a Siena College survey of over 200 historians, however, Reagan ranked sixteenth out of 42. While the debate about Reagan's legacy is ongoing, the 2009 Annual C-SPAN Survey of Presidential Leaders ranked Reagan the 10th greatest president. The survey of leading historians rated Reagan number 11 in 2000. In 2011, the Institute for the Study of the Americas released the first ever British academic survey to rate U.S. presidents. This poll of British specialists in U.S. history and politics placed Reagan as the eighth greatest U.S. president. Reagan's ability to connect with Americans earned him the laudatory moniker "The Great Communicator." Of it, Reagan said, "I won the nickname the great communicator. But I never thought it was my style that made a difference—it was the content. I wasn't a great communicator, but I communicated great things." His age and soft-spoken speech gave him a warm grandfatherly image. Reagan also earned the nickname "the Teflon President," in that public perceptions of him were not tarnished by the controversies that arose during his administration. According to Colorado congresswoman Patricia Schroeder, who coined the phrase, and reporter Howard Kurtz, the epithet referred to Reagan's ability to "do almost anything wrong and not get blamed for it." Public reaction to Reagan was always mixed. He was the oldest president up to that time and was supported by young voters, who began an alliance that shifted many of them to the Republican party. Reagan did not fare well with minority groups, especially African-Americans. However, his support of Israel throughout his presidency earned him support from many Jews. He emphasized family values in his campaigns and during his presidency, although he was the first president to have been divorced. The combination of Reagan's speaking style, unabashed patriotism, negotiation skills, as well as his savvy use of the media, played an important role in defining the 1980s and his future legacy. Reagan was known to joke frequently during his lifetime, displayed humor throughout his presidency, and was famous for his storytelling. His numerous jokes and one-liners have been labeled "classic quips" and "legendary." Among the most notable of his jokes was one regarding the Cold War. 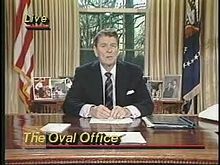 As a microphone test in preparation for his weekly radio address in August 1984, Reagan made the following joke: "My fellow Americans, I'm pleased to tell you today that I've signed legislation that will outlaw Russia forever. We begin bombing in five minutes." Former aide David Gergen commented, "It was that humor... that I think endeared people to Reagan." Reagan never left the United States during World War II, but he kept a film reel that he obtained while he was in the service. The reel depicted the liberation of the Auschwitz concentration camp; he believed that doubts would someday arise as to whether the Holocaust had occurred. It has been alleged that he was overheard telling Israeli foreign minister Yitzhak Shamir in 1983 that he had filmed that footage himself and helped liberate Auschwitz, though this purported conversation was disputed by Secretary of State George P. Shultz. Reagan received a number of awards in his pre- and post-presidential years. After his election as president, Reagan received a lifetime gold membership in the Screen Actors Guild, was inducted into the National Speakers Association Speaker Hall of Fame, and received the United States Military Academy's Sylvanus Thayer Award. In 1981, Reagan was inducted as a Laureate of The Lincoln Academy of Illinois and awarded the Order of Lincoln (the state's highest honor) by the Governor of Illinois in the area of Government. In 1983, he received the highest distinction of the Scout Association of Japan, the Golden Pheasant Award. 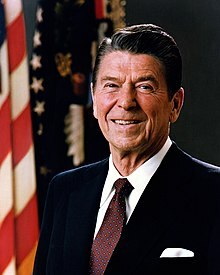 In 1989, Reagan was made an Honorary Knight Grand Cross of the Order of the Bath, one of the highest British orders (this entitled him to the use of the post-nominal letters "GCB" but, as a foreign national, not to be known as "Sir Ronald Reagan"); only two U.S. presidents have received this honor since attaining office, Reagan and George H. W. Bush, while Dwight D. Eisenhower received his before becoming President in his capacity as a general after World War II. Reagan was also named an honorary Fellow of Keble College, Oxford. Japan awarded him the Grand Cordon of the Order of the Chrysanthemum in 1989; he was the second U.S. president to receive the order and the first to have it given to him for personal reasons (Dwight D. Eisenhower received it as a commemoration of U.S.-Japanese relations). In 1990, Reagan was awarded the WPPAC's Top Honor Prize because he signed the Intermediate-Range Nuclear Forces Treaty with H.E. Mikhail Sergeyevich Gorbachev (then President of Russia), ending the cold war. On January 18, 1993, Reagan received the Presidential Medal of Freedom (awarded with distinction), the highest honor that the United States can bestow, from President George H. W. Bush, his Vice President and successor. Reagan was also awarded the Republican Senatorial Medal of Freedom, the highest honor bestowed by Republican members of the Senate. On Reagan's 87th birthday in 1998, Washington National Airport was renamed Ronald Reagan Washington National Airport by a bill signed into law by President Bill Clinton. That year, the Ronald Reagan Building and International Trade Center was dedicated in Washington, D.C. He was among 18 included in Gallup's most admired man and woman poll of the 20th century, from a poll conducted in the U.S. in 1999; two years later, USS Ronald Reagan was christened by Nancy Reagan and the United States Navy. It is one of few Navy ships christened in honor of a living person and the first aircraft carrier to be named in honor of a living former president. In 1998 the U.S. Navy Memorial Foundation awarded Reagan its Naval Heritage award for his support of the U.S. Navy and military in both his film career and while he served as president. 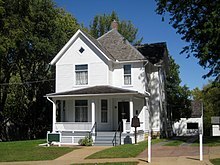 Congress authorized the creation of the Ronald Reagan Boyhood Home in Dixon, Illinois in 2002, pending federal purchase of the property. On May 16 of that year, Nancy Reagan accepted the Congressional Gold Medal, the highest civilian honor bestowed by Congress, on behalf of the president and herself. After Reagan's death, the United States Postal Service issued a President Ronald Reagan commemorative postage stamp in 2005. Later in the year, CNN, along with the editors of Time magazine, named him the "most fascinating person" of the network's first 25 years; Time listed Reagan one of the 100 Most Important People of the 20th century as well. The Discovery Channel asked its viewers to vote for The Greatest American in June 2005; Reagan placed in first place, ahead of Lincoln and Martin Luther King Jr. In 2006, Reagan was inducted into the California Hall of Fame, located at The California Museum. 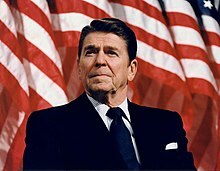 Every year from 2002, California governors Gray Davis and Arnold Schwarzenegger proclaimed February 6 "Ronald Reagan Day" in the state of California in honor of their most famous predecessor. In 2010, Schwarzenegger signed Senate Bill 944, authored by Senator George Runner, to make every February 6 Ronald Reagan Day in California. In 2007, Polish President Lech Kaczyński posthumously conferred on Reagan the highest Polish distinction, the Order of the White Eagle, saying that Reagan had inspired the Polish people to work for change and helped to unseat the repressive communist regime; Kaczyński said it "would not have been possible if it was not for the tough-mindedness, determination, and feeling of mission of President Ronald Reagan." Reagan backed the nation of Poland throughout his presidency, supporting the anti-communist Solidarity movement, along with Pope John Paul II; the Ronald Reagan Park, a public facility in Gdańsk, was named in his honor. On June 3, 2009, Nancy Reagan unveiled a statue of her late husband in the United States Capitol rotunda. The statue represents the state of California in the National Statuary Hall Collection. After Reagan's death, both major American political parties agreed to erect a statue of Reagan in the place of that of Thomas Starr King. The day before, President Obama signed the Ronald Reagan Centennial Commission Act into law, establishing a commission to plan activities to mark the upcoming centenary of Reagan's birth. Independence Day 2011 saw the unveiling of another statue to Reagan—this time in the British capital of London, outside the U.S. embassy in Grosvenor Square. The unveiling was supposed to be attended by Reagan's wife Nancy, but she did not attend; former Secretary of State Condoleezza Rice took her place and read a statement on her behalf; further to the former First Lady's absence, President Reagan's friend and British prime minister during his presidency, Baroness Thatcher, was also unable to attend due to frail health. ^ Murse, Tom (January 28, 2019). "The Most Lopsided Presidential Elections in U.S. History: How a Landslide is Measured". ThoughtCo. Retrieved March 9, 2019. ^ "A Look Back At The Polls". CBS News. Retrieved May 15, 2015. ^ a b "Main Street Historic District, National Register of Historic Places Nomination Form" (PDF). Illinois Historic Preservation Agency. April 1, 1982. Archived from the original (PDF) on August 7, 2007. Retrieved July 27, 2007. ^ Lynette Holloway (December 13, 1996). "Neil Reagan, 88, Ad Executive And Jovial Brother of President". The New York Times. Retrieved March 22, 2009. ^ a b "Facts about Ronald Reagan". Ronald Reagan Presidential Library and Museum. Retrieved March 24, 2019. ^ Janssen, Kim. "Is Ronald Reagan's Chicago boyhood home doomed?". Chicago Sun-Times. Archived from the original on December 2, 2011. Retrieved June 12, 2012. ^ Schribman, David (June 6, 2004). "Reagan, all-American, dies at 93". The Boston Globe. Retrieved January 17, 2008. ^ a b c Rubin, Lyle Jeremy (March 16, 2019). "The Paranoid, Reactionary Dreams of Ronald Reagan". Jacobin (magazine). Retrieved March 17, 2019. ^ Lewis, Warren; Rollmann, Hans, eds. (2005). Restoring the First-century Church in the Twenty-first Century. Wipf and Stock. pp. 181–192. ISBN 978-1-59752-416-2. ^ "Ronald Reagan: Life Before the Presidency". Miller Center. Retrieved August 30, 2015. ^ a b c d e f Cannon, Lou (June 6, 2004). "Actor, Governor, President, Icon". The Washington Post. p. A01. Retrieved January 26, 2008. ^ "Ronald Reagan > Hollywood Years". Ronald Reagan Presidential Foundation. Archived from the original on March 12, 2007. Retrieved March 28, 2007. ^ "Cupid's Influence on the Film Box-office". The Argus (Melbourne, Vic. : 1848–1956). Melbourne, Vic. : National Library of Australia. October 4, 1941. p. 7 Supplement: The Argus Week-end Magazine. Retrieved April 24, 2012. ^ a b Reagan, Ronald (1965). Where's the Rest of Me?. New York: Duell, Sloan, and Pearce. ISBN 978-0-283-98771-7. ^ Wood, Brett. "Kings Row". TCM website. Turner Classic Movies. Retrieved March 24, 2009. ^ Crowther, Bosley (February 3, 1942). "The Screen; 'Kings Row,' With Ann Sheridan and Claude Rains, a Heavy, Rambling Film, Has Its First Showing Here at the Astor". The New York Times. Retrieved March 29, 2007. ^ Friedrich, Otto (1997). City of nets: a portrait of Hollywood in the 1940s. University of California Press (reprint). pp. 86–89, 105–106. ISBN 978-0-520-20949-7. ^ "History of the 11th Armored Cavalry Regiment". 11th Armored Cavalry Regiment. Archived from the original on July 1, 2007. Retrieved November 10, 2008. ^ "USS Ronald Reagan: Ronald Reagan". United States Navy. Archived from the original on October 30, 2007. Retrieved March 7, 2007. ^ a b c "President Ronald Reagan". National Museum of the United States Air Force. Archived from the original on December 22, 2007. Retrieved December 30, 2007. ^ a b c "Military service of Ronald Reagan". Ronald Reagan Presidential Library. Retrieved June 22, 2007. ^ a b "Ronald Reagan 1911–2004". Tampico, Illinois Historical Society. Archived from the original on May 16, 2006. Retrieved December 30, 2007. ^ Hurlburt, Roger (January 6, 1991). "Monroe An Exhibit Of The Early Days Of Marilyn Monroe – Before She Became A Legend – Brings The Star's History In Focus". Sun-Sentinel. Fort Lauderdale, FL. Retrieved November 19, 2012. ^ a b c d "Screen Actors Guild Presidents: Ronald Reagan". Screen Actors Guild. Archived from the original on December 28, 2007. Retrieved November 10, 2008. ^ "American Notes Hollywood". Time. September 9, 1985. Retrieved April 21, 2009. ^ a b "House Un-American Activities Committee Testimony: Ronald Reagan". Tennessee Wesleyan College. October 23, 1947. Archived from the original on December 15, 2007. Retrieved December 30, 2007. ^ GE Reports (June 15, 2011). "GE Theater Introduction" – via YouTube. ^ "Morning Joe - Joe Scarborough, Mika Brzezinski, & Willie Geist". MSNBC.com. ^ "Death Valley Days". CBS Interactive Inc. Retrieved August 25, 2013. ^ Reagan, American Icon. Metzger, Robert Paul. 1989. University of Pennsylvania. p. 26. ^ "Dispute Over Theatre Splits Chicago City Council". The New York Times. May 8, 1984. Retrieved May 17, 2007. ^ Oliver, Marilyn (March 31, 1988). "Locations Range From the Exotic to the Pristine". Los Angeles Times. ^ "Jane Wyman: Biography". JaneWyman.com. Retrieved December 31, 2007. ^ Severo, Richard (September 11, 2007). "Jane Wyman, 90, Star of Film and TV, Is Dead". The New York Times. Retrieved December 31, 2007. ^ "Reagan: Home". HBO. Retrieved September 5, 2011. ^ National Constitution Center (February 6, 2013). "10 interesting facts on Ronald Reagan's birthday". National Constitution Center. Archived from the original on November 5, 2013. Retrieved July 12, 2013. ^ POLITICO. 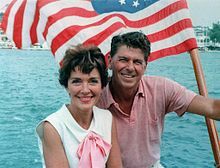 "Jane Wyman, Ronald Reagan's first wife, dies at 93". politico.com. ^ "Nancy Reagan > Her Life & Times". Ronald Reagan Presidential Foundation. Archived from the original on November 12, 2007. Retrieved October 29, 2007. ^ Fieldstadt, Elisha; Gittens, Hasani (March 6, 2016). "Former First Lady Nancy Reagan Dead at 94". NBC News. Retrieved March 6, 2016. ^ a b c d "End of a Love Story". BBC News. June 5, 2004. Retrieved March 21, 2007. ^ "Nancy Davis Reagan". The White House. Archived from the original on January 14, 2008. Retrieved January 13, 2008. ^ a b Berry, Deborah Barfield (June 6, 2004). "By Reagan's Side, but her own person". Newsday. Archived from the original on June 28, 2007. Retrieved August 15, 2007. ^ "Reagan Love Story". MSNBC. June 9, 2004. Retrieved May 25, 2007. ^ Edward M. Yager (2006). Ronald Reagan's Journey: Democrat to Republican. Rowman & Littlefield. pp. 12–15. ISBN 9780742544215. ^ Lori Clune, "Political Ideology and Activism to 1966" in Andrew L. Johns, ed., A Companion to Ronald Reagan (2015) pp. 22–39. ^ J. David Woodard (2012). Ronald Reagan: A Biography. ABC-CLIO. p. 28. ISBN 9780313396397. ^ "President Reagan's Legacy and U.S. Nuclear Weapons Policy". Heritage.org. July 20, 2006. Retrieved April 14, 2014. ^ McCullough, David. Truman. Simon & Schuster, 1992, p. 665. ISBN 0-671-45654-7. ^ Reagan, Ronald (1990). An American Life: The Autobiography. New York City: Simon & Schuster. ISBN 978-0-671-69198-1. ^ Richard Rapaport, June 21, 2009, How AMA 'Coffeecup' gave Reagan a boost. San Francisco Chronicle. ^ Tatalovich, Raymond; Byron W. Daynes, Theodore J. Lowi (2010). Moral Controversies in American Politics (4th ed.). M.E. Sharpe. p. 172. ISBN 978-0-7656-2651-6. ^ "A Time for Choosing". PBS. Retrieved April 17, 2007. ^ Reagan, Ronald. "A time for choosing." (1964) online. ^ Kurt W. Ritter, "Ronald Reagan and 'the speech': The rhetoric of public relations politics." Western Journal of Communication (1968) 32#1 pp. 50–58. ^ National Press Club Luncheon Speakers, Ronald Reagan, June 16, 1966 (Speech). Washington, D.C.: National Press Club. June 16, 1966. Retrieved October 27, 2016 – via Library of Congress, Recorded Sound Research Center. ^ "The Governors' Gallery – Ronald Reagan". California State Library. Retrieved March 21, 2007. ^ Gerard J. De Groot, "'A Goddamned Electable Person': The 1966 California Gubernatorial Campaign of Ronald Reagan." History 82#267 (1997) pp. 429–448. ^ Kahn, Jeffery (June 8, 2004). "Ronald Reagan launched political career using the Berkeley campus as a target". UC Berkeley News. Retrieved March 30, 2007. ^ a b * Fischer, Klaus (2006). America in White, Black, and Gray: The Stormy 1960s. Continuum. pp. 241–243. ISBN 978-0-8264-1816-6. ^ "The New Rules of Play". Time. March 8, 1968. Retrieved October 16, 2007. ^ a b c d Cannon, Lou (2001), p. 50. ^ "Postscript to People's Park". Time. February 16, 1970. Retrieved December 9, 2007. ^ "A Brief History of UCPD: Berkeley, History Topic: People's Park". police.berkeley.edu. August 2006. Archived from the original on December 10, 2015. Retrieved December 9, 2015. ^ "From "A Huey P. Newton Story"". Retrieved July 7, 2010. ^ "How to Stage a Revolution Introduction". Retrieved July 7, 2010. ^ Seneker, Carl J (May 1967). "Governor Reagan and Executive Clemency". California Law Review. 55 (2): 412–418. doi:10.2307/3479351. JSTOR 3479351. ^ Deace, Steve (May 6, 2018). "TOP IOWA CONSERVATIVE: Divorce Is Not The Answer to Domestic Violence". Business Insider. Archived from the original on May 29, 2018. Retrieved May 29, 2018. ^ Kubarych, Roger M (June 9, 2004). "The Reagan Economic Legacy". Council on Foreign Relations. Archived from the original on July 31, 2008. Retrieved August 22, 2007. ^ "Biography of Gerald R. Ford". The White House. Archived from the original on April 11, 2007. Retrieved March 29, 2007. Ford considered himself as "a moderate in domestic affairs, a conservative in fiscal affairs, and a dyed-in-the-wool internationalist in foreign affairs." ^ "Candidate Reagan is Born Again". Time. September 24, 1979. Retrieved May 10, 2008. ^ a b "1976 New Hampshire presidential Primary, February 24, 1976 Republican Results". New Hampshire Political Library. Archived from the original on October 6, 2006. Retrieved November 10, 2008. ^ Hathorn Billy (2010). "Mayor Ernest Angelo Jr., of Midland and the 96–0 Reagan Sweep of Texas, May 1, 1976". West Texas Historical Association Yearbook. 86: 77–91. ^ "Electoral College Box Scores 1789–1996". U.S. National Archives and Records Admin. Retrieved April 30, 2007. ^ "Register of the Ronald Reagan Radio Commentary Sound Recordings, 1967–1980". Retrieved October 7, 2014. ^ "Citizens for the Republic: Who We Are". cftr.org. Archived from the original on September 21, 2013. Retrieved September 19, 2013. ^ Uchitelle, Louis (September 22, 1988). "Bush, Like Reagan in 1980, Seeks Tax Cuts to Stimulate the Economy". The New York Times. Retrieved February 6, 2008. ^ Hakim, Danny (March 14, 2006). "Challengers to Clinton Discuss Plans and Answer Questions". The New York Times. Retrieved February 6, 2008. ^ Kneeland, Douglas E. (August 4, 1980) "Reagan Campaigns at Mississippi Fair; Nominee Tells Crowd of 10,000 He Is Backing States' Rights." The New York Times. p. A11. Retrieved January 1, 2008. ^ a b c d Cannon, Lou (October 4, 2016). "Ronald Reagan: Campaigns and Elections". Miller Center of Public Affairs, University of Virginia. Retrieved March 27, 2018. ^ "1980 Presidential Election Results". Atlas of U.S. Presidential Elections. Retrieved March 28, 2007. ^ Peters, Gerhard; Woollley, John T. "Election of 1980". Santa Barbara, California: The American Presidency Project. Archived from the original on February 12, 2018. Retrieved March 27, 2018. ^ a b * Freidel, Frank; Sidey, Hugh (1995). The Presidents of the United States of America. Washington, D.C.: White House Historical Association. p. 84. ISBN 978-0-912308-57-9. ^ Hayward, Steven F (May 16, 2005). "Reagan in Retrospect". American Enterprise Institute for Public Policy Research. Archived from the original on March 13, 2009. Retrieved April 7, 2009. ^ Reagan, Ronald (2007). The Reagan Diaries. Harper Collins. ISBN 978-0-06-087600-5. Retrieved June 5, 2007. ^ Murray, Robert K.; Tim H. Blessing (1993). Greatness in the White House. Penn State Press. p. 80. ISBN 978-0-271-02486-8. ^ a b David M. Ackerman, The Law of Church and State: Developments in the Supreme Court Since 1980. Novinka Books, 2001. p. 2. ^ "U.S. Supreme Court: Engel v. Vitale, 370 U.S. 421 (1962)". Retrieved July 30, 2016. ^ George de Lama, Reagan Sees An "Uphill Battle" For Prayer In Public Schools. June 7, 1985, Chicago Tribune. ^ a b c Stuart Taylor Jr., High Court Accepts Appeal Of Moment Of Silence Law. January 28, 1987, The New York Times. ^ Lodi News-Sentinel, Reagan Urges School 'Moment of Silence'. July 12, 1984. ^ "Remembering the Assassination Attempt on Ronald Reagan". CNN. March 30, 2001. Retrieved December 19, 2007. ^ D'Souza, Dinesh (June 8, 2004). "Purpose". National Review. Archived from the original on February 3, 2009. Retrieved February 16, 2009. ^ "Remarks and a Question-and-Answer Session With Reporters on the Air Traffic Controllers Strike". Ronald Reagan Presidential Foundation. 1981. Retrieved May 13, 2007. ^ "Unhappy Again". Time. October 6, 1986. Retrieved August 15, 2007. ^ "Employment status of the civilian noninstitutional population 16 years and over, 1940 to date". United States Bureau of Labor Statistics. Retrieved December 6, 2010. ^ "Labor Force Statistics from the Current Population Survey". Data.bls.gov. August 17, 2011. Retrieved October 4, 2012. ^ "Real Gross Domestic Product, 3 Decimal". US. Bureau of Economic Analysis. January 1947. Retrieved September 23, 2015. ^ Karaagac, John (2000). Ronald Reagan and Conservative Reformism. Lexington Books. p. 113. ISBN 978-0-7391-0296-1. ^ Peter B. Levy (1996). Encyclopedia of the Reagan-Bush Years. ABC-CLIO. pp. 305–306. ISBN 9780313290183. ^ a b Bartels, Larry M., L. M. (June 1, 1991). "Constituency Opinion and Congressional Policy Making: The Reagan Defense Build Up". The American Political Science Review. 85 (2): 457–474. doi:10.2307/1963169. ISSN 0003-0554. JSTOR 1963169. ^ Mitchell, Daniel J. (July 19, 1996). "The Historical Lessons of Lower Tax Rates". The Heritage Foundation. Archived from the original on May 30, 2007. Retrieved May 22, 2007. ^ Sahadi, Jeanne (September 12, 2010). "Taxes: What people forget about Reagan". CNN. Retrieved January 27, 2017. ^ "Bruce Bartlett on Tax Increases & Reagan on NRO Financial". Old.nationalreview.com. October 29, 2003. Archived from the original on August 10, 2010. Retrieved August 14, 2010. ^ a b Bartlett, Bruce (February 27, 2009). "Higher Taxes: Will The Republicans Cry Wolf Again?". Forbes. Retrieved August 14, 2010. ^ Tempalski, Jerry (2003). "OTA Paper 81 – Revenue Effects of Major Tax Bills, rev. September 2006" (PDF). United States Department of the Treasury, Office of Tax Analysis. Archived from the original (PDF) on February 21, 2011. Retrieved November 28, 2007. ^ Krugman, Paul (June 8, 2004). "The Great Taxer". The New York Times. Retrieved March 30, 2010. ^ "Even Reagan Raised Taxes," Forbes. Retrieved August 14, 2010. ^ "Gross Domestic Product" (Excel). Bureau of Economic Analysis. July 27, 2007. Retrieved August 15, 2007. ^ Brownlee, Elliot; Graham, Hugh Davis (2003). The Reagan Presidency: Pragmatic Conservatism & Its Legacies. Lawrence, Kansas: University of Kansas Press. pp. 172–173. ^ Steuerle, C. Eugene (1992). The Tax Decade: How Taxes Came to Dominate the Public Agenda. Washington D.C.: The Urban Institute Press. p. 122. ISBN 978-0-87766-523-6. ^ "Historical Budget Data". Congressional Budget Office. March 20, 2009. Archived from the original on July 30, 2008. Retrieved August 10, 2009. ^ "Federal Budget Receipts and Outlays". Presidency.ucsb.edu. Retrieved March 8, 2010. ^ "Annual Statistical Supplement, 2008 – Old-Age, Survivors, and Disability Insurance Trust Funds (4.A)" (PDF). Retrieved March 8, 2010. ^ "Reaganomics". PBS. June 10, 2004. Archived from the original on October 11, 2007. Retrieved August 21, 2007. ^ a b c Meacham, John; Murr, Andrew; Clift, Eleanor; Lipper, Tamara; Breslau, Karen; Ordonez, Jennifer (June 14, 2004). "American Dreamer". Newsweek. Retrieved June 3, 2008. ^ a b c Dreier, Peter (April 3, 2011). "Don't add Reagan's Face to Mount Rushmore". The Nation. ^ "Making Sense of the 'Me Decade'". The Chronicle of Higher Education. Retrieved January 13, 2012. ^ Bartlett, Bruce (June 5, 2012). "Rich Nontaxpayers". The New York Times. ^ Kocieniewski, David (January 18, 2012). "Since 1980s, the Kindest of Tax Cuts for the Rich". The New York Times. Retrieved January 21, 2012. ^ Rampell, Catherine (November 18, 2011). "Tax Pledge May Scuttle a Deal on Deficit". The New York Times. Retrieved January 27, 2012. ^ Krugman, Paul (June 8, 2004). "The Great Taxer". The New York Times. Retrieved August 30, 2011. ^ Barlett, Bruce (April 6, 2010). "Reagan's Tax Increases". CapitalGainsandGames.com. Archived from the original on June 25, 2012. Retrieved April 29, 2012. ^ a b Rosenbaum, David E (January 8, 1986). "Reagan insists Budget Cuts are way to Reduce Deficit". The New York Times. Retrieved August 21, 2008. ^ "Ronald Reagan: Presidency, Domestic Policies". Encyclopædia Britannica. Retrieved August 21, 2008. ^ "Views from the Former Administrators". EPA Journal. Environmental Protection Agency. November 1985. Archived from the original on July 15, 2008. Retrieved August 21, 2008. ^ "The Reagan Presidency". Reagan Presidential Foundation. Archived from the original on May 17, 2008. Retrieved August 4, 2008. ^ Pear, Robert (April 19, 1992). "U.S. to Reconsider Denial of Benefits to Many Disabled". The New York Times. Retrieved May 23, 2008. ^ Bergsten, C. Fred (2001). "Strong Dollar, Weak Policy". The International Economy. ^ Sornette, Didier; Johansen, Anders; &Amp; Bouchaud, Jean-Philippe (1996). "Stock Market Crashes, Precursors and Replicas". Journal de Physique I. 6 (1): 167–175. arXiv:cond-mat/9510036. Bibcode:1996JPhy1...6..167S. CiteSeerX 10.1.1.54.6577. doi:10.1051/jp1:1996135. ^ Brandly, Mark (May 20, 2004). "Will We Run Out of Energy?". Ludwig von Mises Institute. Retrieved November 6, 2008. ^ a b Lieberman, Ben (September 1, 2005). "A Bad Response To Post-Katrina Gas Prices". The Heritage Foundation. Archived from the original on November 1, 2008. Retrieved November 6, 2008. ^ Thorndike, Joseph J. (November 10, 2005). "Historical Perspective: The Windfall Profit Tax—Career of a Concept". TaxHistory.org. Retrieved November 6, 2008. ^ a b "Reagan's Economic Legacy". Business Week. June 21, 2004. Archived from the original on June 8, 2007. Retrieved July 1, 2007. ^ Koprowski, Gene (March 7, 1991). "Tech Intelligence Revival? Commerce May Model on DIA's Project Socrates". Washington Technology. ^ Smith, Esther (May 5, 1988). "DoD Unveils Competitive Tool: Project Socrates Offers Valuable Analysis". Washington Technology. ^ Days III, Drew S. (1984). "Turning Back the Clock: The Reagan Administration and Civil Rights". Yale Law School Legal Scholarship Repository. Retrieved April 8, 2018. ^ Herbers, John (January 24, 1982). "Reagan's Changes On Rights Are Starting To Have An Impact". The New York Times. Retrieved April 8, 2018. ^ Raines, Howell (June 30, 1982). "Voting Rights Act Signed by Reagan". The New York Times. Retrieved May 10, 2015. ^ Clines, Francis X. (October 22, 1983). "Reagan's Doubts on Dr. King Exposed". The New York Times. Retrieved April 8, 2018. ^ Shull, Steven A. (1999). American Civil Rights Policy from Truman to Clinton: The Role of Presidential Leadership. M.E. Sharpe. p. 94. ISBN 978-0-7656-0393-7. ^ Reagan, Ronald. (June 8, 1982). "Ronald Reagan Address to British Parliament". The History Place. Retrieved April 19, 2006. ^ "Towards an International History of the War in Afghanistan, 1979–89". The Woodrow Wilson International Center for Scholars. 2002. Archived from the original on October 11, 2007. Retrieved May 16, 2007. ^ "LGM-118A Peacekeeper". Federation of American Scientists. August 15, 2000. Retrieved April 10, 2007. ^ "Großdemo gegen Nato-Doppelbeschluss, Spiegel on the mass protests against deployment of nuclear weapons in West Germany". Spiegel Online. June 10, 2008. ^ Esno, Tyler (July 26, 2017). "Reagan's Economic War on the Soviet Union". Diplomatic History. 42 (2): 281–304. doi:10.1093/dh/dhx061. ISSN 0145-2096. ^ Norman A. Graebner; Richard Dean Burns; Joseph M. Siracusa (2008). Reagan, Bush, Gorbachev: Revisiting the End of the Cold War. Greenwood. pp. 29–31. ISBN 9780313352416. ^ "Reagan and Thatcher, political soul mates". MSNBC. Associated Press. June 5, 2004. Retrieved June 24, 2008. ^ "Former President Reagan Dies at 93". Los Angeles Times. June 6, 2004. Retrieved March 7, 2007. ^ a b "1983: Korean Airlines flight shot down by Soviet Union". A&E Television. Archived from the original on March 3, 2007. Retrieved April 10, 2007. ^ Pace (1995). "GPS History, Chronology, and Budgets" (PDF). The Global Positioning System. Rand. p. 248. ^ Stephen S. Rosenfeld (Spring 1986). "The Reagan Doctrine: The Guns of July". Foreign Affairs. 64 (4). Archived from the original on September 30, 2007. ^ Crile, George (2003). Charlie Wilson's War: The Extraordinary Story of the Largest Covert Operation in History. Atlantic Monthly Press. ISBN 978-0-87113-854-5. ^ Pach, Chester (2006). "The Reagan Doctrine: Principle, Pragmatism, and Policy". Presidential Studies Quarterly. 36 (1): 75–88. doi:10.1111/j.1741-5705.2006.00288.x. JSTOR 27552748. ^ Coll, Steve (July 19, 1992). "Anatomy of a Victory: CIA's Covert Afghan War". The Washington Post. Retrieved February 24, 2009. ^ Harnden, Toby (September 26, 2001). "Taliban still have Reagan's Stingers". The Telegraph. London. Retrieved September 17, 2010. ^ Tower, John; Muskie, Edmund; Scowcroft, Brent (1987). Report of the President's Special Review Board. Bantam Books. p. 104. ISBN 9780553269680. Available online here. ^ a b c "Deploy or Perish: SDI and Domestic Politics". Scholarship Editions. Retrieved April 10, 2007. ^ Adelman, Ken (July 8, 2003). "SDI:The Next Generation". Fox News Channel. Archived from the original on August 7, 2007. Retrieved March 15, 2007. ^ a b "Foreign Affairs: Ronald Reagan". PBS. Archived from the original on June 16, 2007. Retrieved June 6, 2007. ^ a b Thomas, Rhys (Writer/Producer) (2005). The Presidents (Documentary). A&E Television. ^ From U.S. Ally to Convicted War Criminal: Inside Chad's Hissène Habré's Close Ties to Reagan Admin. Democracy Now! May 31, 2016. ^ What Guilt Does the U.S. Bear in Guatemala? The New York Times, May 19, 2013. Retrieved July 1, 2014. ^ a b Did Reagan Finance Genocide in Guatemala?, ABC News, Santiago Wills, May 14, 2013. "The [Guatemalan] army was targeting the Ixil and other indigenous groups, killing them indiscriminately, whether they had helped the guerrillas or not... "
^ Allan Nairn: After Ríos Montt Verdict, Time for U.S. to Account for Its Role in Guatemalan Genocide. Democracy Now! May 15, 2013. ^ Ronald Reagan’s genocidal secret: A true story of right-wing impunity in Guatemala, Salon, Miles Culpepper, 2015. ^ Timothy J. Geraghty (2009). Peacekeepers at War: Beirut 1983 – The Marine Commander Tells His Story. Potomac Books. p. 254. ISBN 978-1-59797-595-7. ^ Lou Cannon & Carl M. Cannon (2007). Reagan's Disciple: George W. Bush's Troubled Quest for a Presidential Legacy. PublicAffairs. p. 154. ISBN 9781586486297. ^ a b "Operation Agent Fury" (PDF). Defense Technical Information Center. Archived from the original (PDF) on June 5, 2007. Retrieved March 9, 2007. ^ Cooper, Tom (September 1, 2003). "Grenada, 1983: Operation 'Urgent Fury'". Air Combat Information Group. Archived from the original on April 3, 2007. Retrieved April 8, 2007. ^ "Los Angeles 1984". Swedish Olympic Committee. Archived from the original on December 30, 2006. Retrieved March 7, 2007. ^ "The Debate: Mondale vs. Reagan". National Review. October 4, 2004. Archived from the original on April 16, 2007. Retrieved May 25, 2007. ^ "Reaction to first Mondale/Reagan debate". PBS. October 8, 1984. Archived from the original on January 25, 2008. Retrieved December 31, 2007. ^ "1984 Presidential Debates". CNN. Archived from the original on March 8, 2007. Retrieved May 25, 2007. ^ "The Reagan Presidency". Ronald Reagan Presidential Foundation. Retrieved April 19, 2008. ^ "1984 Presidential Election Results". David Leip. Retrieved May 25, 2007. ^ Peters, Gerhard; Woollley, John T. "Election of 1984". Santa Barbara, California: The American Presidency Project. Archived from the original on February 1, 2018. Retrieved March 30, 2018. ^ a b "Phil Gailey and Warren Weaver Jr., "Briefing"". The New York Times. June 5, 1982. Retrieved January 27, 2011. ^ Berkes, Howard (January 28, 2006). "Challenger: Reporting a Disaster's Cold, Hard Facts". NPR. Retrieved April 19, 2008. ^ Noonan, Peggy (January 28, 1986). "Address to the Nation on the Explosion of the Space Shuttle Challenger". University of Texas. Retrieved December 27, 2009. ^ Richard J. Jensen, Reagan at Bergen-Belsen and Bitburg (Texas A&M University Press, 2007). ^ President Reagan: The Role Of A Lifetime, Lou Cannon, 1991, pages 507-08. ^ Reagan Defends Cemetery Visit : Says German Dead Are Also Victims of Nazis, Los Angeles Times, Don Shannon, April 19, 1985. ^ Buchanan, Pat (1999). "Pat Buchanan's Response to Norman Podhoretz's OP-ED". The Internet Brigade. Archived from the original on September 27, 2007. Retrieved September 3, 2007. ^ Alexander, Michelle (2010). The New Jim Crow. New York: The New Press. p. 5. ISBN 978-1-59558-103-7. ^ Lamar, Jacob V., Jr (September 22, 1986). "Rolling Out the Big Guns". Time. Retrieved August 20, 2007. ^ Randall, Vernellia R. (April 18, 2006). "The Drug War as Race War". The University of Dayton School of Law. Retrieved April 11, 2007. ^ a b "Thirty Years of America's Drug War". Retrieved April 4, 2007. ^ "The Reagan-Era Drug War Legacy". Drug Reform Coordination Network. June 11, 2004. Retrieved April 4, 2007. ^ "NIDA InfoFacts: High School and Youth Trends". National Institute on Drug Abuse, NIH. Retrieved April 4, 2007. ^ "Interview: Dr. Herbert Kleber". PBS. Retrieved June 12, 2007. The politics of the Reagan years and the Bush years probably made it somewhat harder to get treatment expanded, but at the same time, it probably had a good effect in terms of decreasing initiation and use. For example, marijuana went from thirty-three percent of high-school seniors in 1980 to twelve percent in 1991. ^ "The 'just say no' first lady". MSNBC. February 18, 2004. Retrieved June 24, 2007. ^ Ganga, Maria L La (March 11, 2016). "The first lady who looked away: Nancy and the Reagans' troubling Aids legacy". The Guardian. Retrieved March 8, 2019. ^ Lopez, German (November 1, 2015). "The Reagan administration's unbelievable response to the HIV/AIDS epidemic". Vox. Retrieved March 8, 2019. ^ Bronski, Michael. "Rewriting the Script on Reagan: Why the President Ignored AIDS". Retrieved March 13, 2016. ^ Shilts, Randy (November 27, 2007). And the Band Played On: Politics, People, and the AIDS Epidemic. Macmillan. ISBN 9781429930390. Retrieved March 12, 2016. ^ "Reagan and AIDS: A Reassessment - IGF Culture Watch". IGF Culture Watch. June 24, 2004. Retrieved January 12, 2015. ^ Toner, Robin; Pear, Robert (June 9, 2004). "THE 40TH PRESIDENT: THE OPPONENTS; Critics See a Reagan Legacy Tainted by AIDS, Civil Rights and Union Policies". The New York Times. ISSN 0362-4331. Retrieved April 9, 2018. ^ "Libya: Fury in the Isolation Ward". Time. August 23, 1982. Retrieved August 12, 2011. ^ a b "Operation El Dorado Canyon". GlobalSecurity.org. April 25, 2005. Retrieved April 19, 2008. ^ a b c "1986:US Launches air-strike on Libya". BBC News. April 15, 2008. Retrieved April 19, 2008. ^ "A/RES/41/38 November 20, 1986". United Nations. Retrieved April 14, 2014. ^ Graham, Otis (January 27, 2003). "Ronald Reagan's Big Mistake". The American Conservative. Archived from the original on July 29, 2007. Retrieved August 15, 2007. ^ a b Reagan, Ronald. (November 6, 1986) Statement on Signing the Immigration Reform and Control Act of 1986. Collected Speeches, Ronald Reagan Presidential Library. Retrieved August 15, 2007. ^ "Understanding the Iran-Contra Affairs". www.brown.edu. ^ "The Iran Contra scandal". CNN. 2001. Retrieved August 14, 2007. ^ Parry, Robert (June 2, 2004). "NYT's apologies miss the point". Consortium for Independent Journalism. Retrieved April 1, 2007. ^ Morrison, Fred L., F. L. (January 1, 1987). "Legal Issues in The Nicaragua Opinion". American Journal of International Law. 81 (1): 160–166. doi:10.2307/2202146. ISSN 0002-9300. JSTOR 2202146. ^ "Managua wants $1B from US; demand would follow word court ruling". The Boston Globe. Associated Press. June 29, 1986. ^ "Military and Paramilitary Activities in and against Nicaragua (Nicaragua v. United States of America)". Cases. International Court of Justice. June 27, 1986. Retrieved January 24, 2009. ^ a b "Reagan's mixed White House legacy". BBC News. June 6, 2004. Retrieved August 19, 2007. ^ Mayer, Jane; McManus, Doyle (1988). Landslide: The Unmaking of The President, 1984–1988. Houghton Mifflin. pp. 292, 437. ISBN 978-0-395-45185-4. ^ Dwyer, Paula (June 23, 1997). "Pointing a Finger at Reagan". Business Week. Archived from the original on August 7, 2007. Retrieved August 23, 2007. ^ a b Sullivan, Kevin & Mary Jordan (June 10, 2004). "In Central America, Reagan Remains A Polarizing Figure". The Washington Post. Retrieved June 18, 2007. ^ Hamm, Manfred R. (June 23, 1983). "New Evidence of Moscow's Military Threat". The Heritage Foundation. Archived from the original on October 11, 2007. Retrieved May 13, 2007. ^ Lebow, Richard Ned & Stein, Janice Gross (February 1994). "Reagan and the Russians". The Atlantic. Retrieved May 28, 2010. ^ Gaidar, Yegor (2007). Collapse of an Empire: Lessons for Modern Russia. Brookings Institution Press. pp. 190–205. ^ Robert C. Rowland and John M. Jones, "Reagan's Strategy for the Cold War and the Evil Empire Address." Rhetoric & Public Affairs 19.3 (2016): 427-463. ^ a b c d e Knopf, PhD, Jeffery W. (August 2004). "Did Reagan Win the Cold War?". Strategic Insights. III (8). Retrieved January 6, 2008. ^ "Modern History Sourcebook: Ronald Reagan: Evil Empire Speech, June 8, 1982". Fordham University. May 1998. Retrieved November 15, 2007. ^ John Lewis Gaddis (2006). The Cold War: A New History. p. 31. ISBN 9781440684500. ^ "INF Treaty". US State Department. Retrieved May 28, 2007. ^ Lettow, Paul (July 20, 2006). "President Reagan's Legacy and U.S. Nuclear Weapons Policy". The Heritage Foundation. Archived from the original on April 11, 2010. ^ Talbott, Strobe (August 5, 1991). "The Summit Goodfellas". Time. Retrieved January 26, 2008. ^ Weisman, Steven R. (September 8, 1983). "Reagan Begins to Wear a Hearing Aid in Public". The New York Times. Retrieved June 13, 2008. ^ "Reagan Begins Using A Second Hearing Aid". United Press International. March 21, 1985. Retrieved June 13, 2008. ^ Friess, Steve (August 9, 2006). "He amplifies hearing aids". USA Today. Retrieved June 13, 2008. ^ "What is the 25th Amendment and When Has It Been Invoked?". History News Network. Retrieved June 6, 2007. ^ Boyd, Gerald M (August 2, 1985). "'Irritated Skin' is Removed from Side of Reagan's Nose". The New York Times. Retrieved June 13, 2008. ^ Herron, Caroline Rand & Michael Wright (October 13, 1987). "Balancing the Budget and Politics; More Cancer on Reagan's Nose". The New York Times. Retrieved June 13, 2008. ^ Altman, Lawrence K (January 6, 1987). "President is Well after Operation to Ease Prostate". The New York Times. Retrieved June 13, 2008. ^ Herron, Caroline Rand & Martha A. Miles (August 2, 1987). "The Nation; Cancer Found on Reagan's Nose". The New York Times. Retrieved June 13, 2008. ^ "Statement by Assistant to the President for Press Relations Fitzwater on the President's Hand Surgery". Ronald Reagan Presidential Library. January 7, 1989. Archived from the original on August 18, 2016. Retrieved June 14, 2016. ^ Reston, James (July 5, 1987). "Washington; Kennedy And Bork". The New York Times. Retrieved April 28, 2008. ^ Greenhouse, Linda (October 24, 1987). "Bork's Nomination Is Rejected, 58–42; Reagan 'Saddened'". The New York Times. Retrieved November 12, 2007. ^ "Anthony M. Kennedy". Supreme Court Historical Society. 1999. Archived from the original on November 3, 2007. Retrieved November 12, 2007. ^ "Pendleton, Clarence M. Jr". Notable Kentucky African Americans Database. University of Kentucky. Retrieved March 19, 2013. ^ Gerald B. Jordan (June 7, 1988). "Pendleton Is Remembered Kindly But Colleague Regrets Official's Sharp Rhetoric". The Philadelphia Inquirer. Retrieved March 16, 2013. ^ "Clarence Pendleton Blasts Comparable Pay Concept". Jet. December 10, 1984. p. 19. Retrieved March 16, 2013. ^ Netburn, Deborah (December 24, 2006). "Agenting for God". Los Angeles Times. Retrieved August 15, 2007. ^ "1992 Republican National Convention, Houston". The Heritage Foundation. August 17, 1992. Archived from the original on March 11, 2007. Retrieved March 29, 2007. ^ Reinhold, Robert (November 5, 1991). "Four Presidents Join Reagan in Dedicating His Library". The New York Times. ^ Reagan, Ronald (March 29, 1991). "Why I'm for the Brady Bill". The New York Times. Retrieved June 22, 2010. ^ "The Ronald Reagan Freedom Award". Ronald Reagan Presidential Foundation. Archived from the original on August 28, 2007. Retrieved March 23, 2007. ^ a b c d Gordon, Michael R (November 6, 1994). "In Poignant Public Letter, Reagan Reveals That He Has Alzheimer's". The New York Times. Retrieved December 30, 2007. ^ "The Alzheimer's Letter". PBS. Archived from the original on December 16, 2006. Retrieved March 7, 2007. ^ Altman, Lawrence K (November 13, 1994). "November 6–12: Amid Rumors; Reagan Discloses His Alzheimer's". The New York Times. Retrieved June 18, 2008. ^ "President Ronald Reagan's Alzheimer's Disease". Radio National. June 7, 2004. Retrieved January 7, 2008. ^ Jacob Weisberg (January 5, 2016). Ronald Reagan: The American Presidents Series: The 40th President, 1981–1989. Henry Holt and Company. p. 72. ISBN 978-0-8050-9728-3. ^ Jet. Johnson Publishing Company. July 9, 1981. p. 5. ISSN 0021-5996. ^ Associated Press (June 19, 1981). "Cabinet Aide Greeted by Reagan as 'mayor'". The New York Times. Retrieved January 24, 2018. ^ Pilkington, Ed (January 17, 2011). 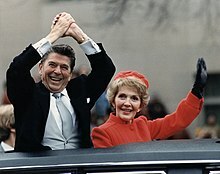 "Ronald Reagan had Alzheimer's while president, says son". The Guardian. ^ Lesley Stahl (1999). Reporting Live. Simon & Schuster. pp. 256 & 318. ISBN 978-0-684-82930-2. ^ a b c d e f g h i Altman, Lawrence K (October 5, 1997). "Reagan's Twilight – A special report; A President Fades Into a World Apart". The New York Times. Retrieved June 18, 2008. ^ a b Altman, Lawrence K. (June 15, 2004). "The Doctors World; A Recollection of Early Questions About Reagan's Health". The New York Times. Retrieved January 7, 2008. ^ Morris, Edmund (January 23, 2011). "Edmund Morris: Reagan and Alzheimer's". Newsweek. Retrieved March 6, 2016. ^ Van Den Heuvel C, Thornton E, Vink R (2007). "Traumatic brain injury and Alzheimer's disease: A review". Neurotrauma: New Insights into Pathology and Treatment. Progress in Brain Research. 161. pp. 303–316. doi:10.1016/S0079-6123(06)61021-2. ISBN 978-0-444-53017-2. PMID 17618986. ^ Szczygielski J, Mautes A, Steudel WI, Falkai P, Bayer TA, Wirths O (November 2005). "Traumatic brain injury: cause or risk of Alzheimer's disease? A review of experimental studies". Journal of Neural Transmission. 112 (11): 1547–1564. doi:10.1007/s00702-005-0326-0. PMID 15959838. ^ "Reagan Breaks Hip In Fall at His Home". The New York Times. January 13, 2001. Retrieved June 18, 2008. ^ "Reagan recovering from hip surgery, wife Nancy remains at his side". CNN. January 15, 2001. Retrieved June 13, 2008. ^ "Reagan able to sit up after hip repair". CNN. January 15, 2001. Archived from the original on February 26, 2008. Retrieved June 18, 2008. ^ "Reagan Resting Comfortably After Hip Surgery". CNN. January 13, 2001. Retrieved December 28, 2007. ^ "Nancy Reagan Reflects on Ronald". CNN. March 4, 2001. Retrieved April 6, 2007. ^ Gordon, Craig (March 9, 2009). "Nancy Reagan praises Obama". Politico. Retrieved October 27, 2011. ^ "Nancy Reagan plea on stem cells". BBC News. May 10, 2004. Retrieved June 6, 2007. ^ "Former President Reagan Dies at 93". Los Angeles Times. June 6, 2004. Retrieved July 9, 2013. ^ a b Von Drehle, David (June 6, 2004). "Ronald Reagan Dies: 40th President Reshaped American Politics". The Washington Post. Retrieved December 21, 2007. ^ "Announcing the Death of Ronald Reagan" (Press release). The White House, Office of the Press Secretary. June 6, 2004. Retrieved January 23, 2008. ^ "Ronald Reagan: Tributes". BBC News. June 6, 2004. Retrieved January 23, 2008. ^ Leigh, Andrew (June 7, 2004). "Saying Goodbye in Santa Monica". National Review. Archived from the original on March 30, 2007. Retrieved March 9, 2007. ^ "100,000 file past Reagan's casket". CNN. June 9, 2004. Retrieved August 15, 2007. ^ "Lying In State for former President Reagan" (Press release). United States Capitol Police. June 11, 2004. Archived from the original on September 27, 2007. Retrieved August 15, 2007. ^ "Thatcher's eulogy can be viewed online". Margaretthatcher.org. Retrieved March 8, 2010. ^ "BBC NEWS – Americas – Reagan funeral guest list". BBC. ^ "A Nation Bids Reagan Farewell: Prayer And Recollections At National Funeral For 40th President". CBS. Associated Press. June 11, 2004. Retrieved December 21, 2007. ^ "Ronald Reagan Library Opening". Plan B Productions. November 4, 1991. Retrieved March 23, 2007. ^ Andrew L. Johns, ed., A Companion to Ronald Reagan (Wiley-Blackwell, 2015). ^ "Ronald Reagan restored faith in America". Retrieved October 7, 2014. ^ Lipset, Seymour Martin; Schneider, William. "The Decline of Confidence in American Institutions" (PDF). Political Science Quarterly. Archived from the original (PDF) on August 22, 2016. Retrieved July 18, 2016. ^ Gilman, Larry. "Iran-Contra Affair". Advameg. Retrieved August 23, 2007. ^ Feulner, Edwin J. (June 9, 2004). "The Legacy of Ronald Reagan". The Heritage Foundation. Archived from the original on October 11, 2007. Retrieved August 23, 2007. ^ Weisbrot, Mark (June 7, 2004). "Ronald Reagan's Legacy". Common Dreams News Center. Retrieved August 23, 2007. ^ Kurtz, Howard (June 7, 2004). "Reagan: The Retake". The Washington Post. Retrieved August 25, 2005. ^ "American President". Archived from the original on October 11, 2014. Retrieved October 7, 2014. ^ Henry, David (December 2009). "Ronald Reagan and the 1980s: Perceptions, Policies, Legacies. Ed. by Cheryl Hudson and Gareth Davies. (New York: Palgrave Macmillan, 2008. xiv, 268 pp. $84.95, ISBN 978-0-230-60302-8.)". The Journal of American History. 96 (3): 933–934. doi:10.1093/jahist/96.3.933. JSTOR 25622627. ^ Johns, Andrew L., ed. (2015). A Companion to Ronald Reagan. Wiley. pp. 1–2. ISBN 9781118607824. ^ For example, Peter Schweizer, Reagan's War: The Epic Story of his Forty Year Struggle and Final Triumph Over Communism (2002). ^ Lebow, Richard Ned; Stein, Janice Gross (February 1994). "Reagan and the Russians". The Atlantic. 273 (2): 35–37. Retrieved February 11, 2017. ^ a b Heintz, Jim (June 7, 2004). "Gorbachev mourns loss of honest rival". Oakland Tribune. Associated Press. Archived from the original (Reprint) on May 1, 2011. Retrieved January 6, 2008. ^ Kaiser, Robert G (June 11, 2004). "Gorbachev: 'We All Lost Cold War'". The Washington Post. p. A01. Retrieved January 6, 2008. ^ "Full Text: Thatcher Eulogy to Reagan". BBC News. June 11, 2004. Retrieved January 6, 2008. ^ "Reagan and Thatcher; political soul mates". MSNBC. June 5, 2004. Retrieved January 8, 2008. ^ Clayton, Ian (June 5, 2004). "America's Movie Star President". Canadian Broadcasting Corporation. Archived from the original on December 27, 2007. Retrieved January 6, 2008. ^ "Ronald Reagan: Tributes". BBC News. June 6, 2004. Retrieved February 10, 2008. ^ Chapman, Roger (June 14, 2004). "Reagan's Role in Ending the Cold War Is Being Exaggerated". George Mason University. Retrieved January 6, 2008. ^ a b c Loughlin, Sean (July 6, 2004). "Reagan cast a wide shadow in politics". CNN. Retrieved June 19, 2008. ^ "Ronald Reagan Remains Potent Republican Icon". Voice of America. February 11, 2011. Retrieved June 12, 2012. ^ Broder, John M (January 20, 2008). "The Gipper Gap: In Search of Reagan". The New York Times. Retrieved January 26, 2008. ^ Issenberg, Sasha (February 8, 2008). "McCain touts conservative record". The Boston Globe. Retrieved June 19, 2008. ^ "Reagan's First Inaugural: "Government is not the solution to our problem; government is the problem."". The Heritage Foundation. Archived from the original on June 24, 2013. Retrieved July 15, 2013. ^ Raasch, Chuck (June 10, 2004). "Reagan transformed presidency into iconic place in American culture". USA Today. Retrieved July 2, 2008. ^ "Ronald Reagan". MSN Encarta. Archived from the original on May 10, 2008. Retrieved March 4, 2008. ^ "Toward the Summit; Previous Reagan-Gorbachev Summits". The New York Times. May 28, 1988. Retrieved March 8, 2008. ^ "1987: Superpowers to reverse arms race". BBC News. December 8, 1987. Retrieved February 7, 2014. ^ Woolley, John; Peters, Gerhard. "Presidential Job Approval". Pesidency.ucsb.edu. The American Presidency Project. Retrieved July 25, 2016. ^ Sussman, Dalia (August 6, 2001). "Improving With Age: Reagan Approval Grows Better in Retrospect". ABC. Retrieved April 8, 2007. ^ "How the Presidents Stack Up". The Wall Street Journal. Retrieved September 7, 2007. ^ "Reagan Tops Presidential Poll". CBS. February 19, 2001. Retrieved September 7, 2007. ^ "Presidents and History". Polling Report. Retrieved March 18, 2007. ^ "Post-War Presidents: JFK, Ike, Reagan Most Popular". Rasmussen Reports. Archived from the original on October 11, 2007. Retrieved November 10, 2008. ^ "Presidential Survey". Siena Research Institute. Archived from the original on November 12, 2007. Retrieved August 28, 2007. ^ Hines, Nico (October 31, 2008). "The top ten – The Times US presidential rankings". The Times. UK. Retrieved January 12, 2009. ^ C-SPAN (February 16, 2009). "C-SPAN Survey of Presidential Leaders". Archived from the original on May 3, 2011. Retrieved April 20, 2012. ^ "USPC Survey". Americas.sas.ac.uk. Archived from the original on July 30, 2011. Retrieved August 12, 2011. ^ a b Schroeder, Patricia (June 6, 2004). "Nothing stuck to 'Teflon President'". USA Today. Retrieved January 8, 2008. ^ "'The Great Communicator' strikes chord with public". CNN. 2001. Retrieved January 8, 2008. ^ "Reagan: The great communicator". BBC News. June 5, 2004. Retrieved January 26, 2008. ^ "Mourning in America: Ronald Reagan Dies at 93". Fox News Channel. June 5, 2004. Archived from the original on June 4, 2010. Retrieved December 4, 2009. ^ "The Reagan Diaries". The High Hat. Retrieved December 4, 2009. ^ "Sunday Culture: Charlie Wilson's War?". theseminal. Archived from the original on February 12, 2008. Retrieved December 4, 2009. ^ a b Kurtz, Howard (June 7, 2004). "15 Years Later, the Remaking of a President". The Washington Post. Retrieved January 25, 2008. ^ Sprengelmeyer, M.E. (June 9, 2004). "'Teflon' moniker didn't have intended effect on Reagan". Howard Scripps News Service. Archived from the original on January 24, 2008. Retrieved January 8, 2008. ^ Dionne, E.J. (October 31, 1988). "Political Memo; G.O.P. Makes Reagan Lure Of Young a Long-Term Asset". The New York Times. Retrieved July 2, 2008. ^ Geffen, David. "Reagan, Ronald Wilson". Jewish Virtual Library. Archived from the original on April 29, 2011. Retrieved July 8, 2009. ^ Hendrix, Anastasia (June 6, 2004). "Trouble at home for family values advocate". San Francisco Chronicle. Retrieved March 4, 2008. ^ Troy, Gil (2005). Morning in America: how Ronald . ISBN 978-0-691-09645-2. Retrieved March 8, 2010. ^ Marinucci, Carla & Carolyn Lochhead (June 12, 2004). "Last Goodbye: Ex-president eulogized in D.C. before final ride into California sunset; Laid to Rest: Ceremony ends weeklong outpouring of grief". San Francisco Chronicle. Retrieved October 15, 2009. ^ "Ronald Reagan, Master Storyteller". CBS. June 6, 2004. Retrieved March 4, 2008. ^ McCuddy, Bill (June 6, 2004). "Remembering Reagan's Humor". Fox News Channel. Archived from the original on April 14, 2008. Retrieved July 2, 2008. ^ "Remembering President Reagan For His Humor-A Classic Radio Gaffe". About. Retrieved January 22, 2007. ^ "Zig Ziglar Bio". Zig Ziglar. Archived from the original on August 24, 2011. Retrieved September 6, 2011. ^ "Association of Graduates USMA: Sylvanus Thayer Award Recipients". Association of Graduates, West Point, New York. Archived from the original on July 3, 2007. Retrieved March 22, 2007. ^ "Laureates by Year – The Lincoln Academy of Illinois". The Lincoln Academy of Illinois. Retrieved March 7, 2016. ^ "䝪䞊䜲䝇䜹䜴䝖日本連盟 きじ章受章者" (PDF). Reinanzaka-sc.o.oo7.jp (in Japanese). Retrieved February 12, 2017. ^ "Order of the Bath". The Official website of the British Monarchy. Archived from the original on April 26, 2007. Retrieved March 22, 2007. ^ Weisman, Steven R (October 24, 1989). "Reagan Given Top Award by Japanese". The New York Times. Retrieved March 21, 2008. ^ World Peace Prize Recipients World Peace Prize. ^ Top Honer Prize Ronald Reagan WPPAC. (October 1990). ^ "Remarks on presenting the Presidential Medal of Freedom to President Ronald Reagan-President George Bush-Transcript". The White House: Weekly Compilation of Presidential Documents. January 18, 1993. Archived from the original on July 1, 2015. Retrieved June 29, 2015. ^ "Julio E. Bonfante". LeBonfante International Investors Group. Archived from the original on January 30, 2008. Retrieved January 26, 2008. ^ "Ronald Reagan Building and International Trade Center". U.S. General Services Administration. Retrieved March 22, 2007. ^ "USS Ronald Reagan Commemorates Former President's 90th Birthday". CNN. July 12, 2003. Retrieved January 25, 2008. ^ "Naval Heritage Award Recipients". United States Navy Memorial. Archived from the original on October 16, 2015. Retrieved October 25, 2015. ^ "Public Law 107-137" (PDF). United States Government Printing Office. February 6, 2002. Retrieved December 31, 2007. ^ "Congressional Gold Medal Recipients 1776 to present". Office of the Clerk, US House of Representatives. Retrieved March 22, 2007. ^ "Postmaster General, Nancy Reagan unveil Ronald Reagan stamp image, stamp available next year" (Press release). USPS. November 9, 2004. Retrieved May 13, 2007. ^ "Top 25: Fascinating People". CNN. June 19, 2005. Retrieved June 19, 2005. ^ "Time 100: The Most Important People of the Century". Time. 2003. Retrieved March 7, 2007. ^ "Greatest American". Discovery Channel. Archived from the original on March 12, 2007. Retrieved March 21, 2007. ^ Geiger, Kimberly (August 1, 2006). "California: State to establish a Hall of Fame; Disney, Reagan and Alice Walker among 1st inductees". San Francisco Chronicle. Retrieved March 21, 2008. ^ "Governor Davis Proclaims February 6, 2002 "Ronald Reagan Day" in California". Office of the Governor, State of California. February 6, 2002. ^ "Governor Schwarzenegger Signs Legislation Honoring President Ronald Reagan". Office of Governor Arnold Schwarzenegger. July 19, 2010. ^ "President Kaczyński Presents Order of the White Eagle to Late President Ronald Reagan". United States Department of State. July 18, 2007. Archived from the original on March 5, 2009. Retrieved February 10, 2008. ^ Bernstein, Carl (February 24, 1992). "The Holy Alliance". Time. Retrieved August 18, 2007. 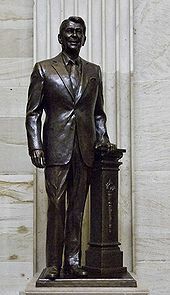 ^ "Reagan statue unveiled in Capitol Rotunda". MSNBC. Associated Press. June 3, 2009. Retrieved February 8, 2011. ^ "Obama creates Reagan centennial commission". MSNBC. Associated Press. June 2, 2009. Retrieved February 8, 2011. ^ "Ronald Reagan statue unveiled at US Embassy in London". BBC News. July 4, 2011. Retrieved August 12, 2011. Beschloss, Michael (2008). Presidential Courage: Brave Leaders and How they Changed America 1789–1989. Simon & Schuster. ISBN 978-0-7432-5744-2. Bumgarner, John R. (1994). The Health of the Presidents: The 41 United States Presidents Through 1993 from a Physician's Point of View. Jefferson, NC: MacFarland & Company. ISBN 978-0-89950-956-3. Cannon, Lou (2000) . President Reagan: The Role of a Lifetime. New York: PublicAffairs. ISBN 978-1-891620-91-1. Cannon, Lou; Beschloss, Michael (2001). Ronald Reagan: The Presidential Portfolio: A History Illustrated from the Collection of the Ronald Reagan Library and Museum. PublicAffairs. ISBN 978-1-891620-84-3. Hayward, Steven F. (2009). The Age of Reagan: The Conservative Counterrevolution: 1980–1989. ISBN 978-0-307-45369-3. Pemberton, William E. (1998). Exit With Honor: The Life and Presidency of Ronald Reagan. ISBN 978-0-7656-0096-7. Reeves, Richard (2005). President Reagan: The Triumph of Imagination. New York: Simon & Schuster. ISBN 978-0-7432-3022-3. Wills, Garry (1987). Reagan's America: Innocents at Home. Garden City, NY: Doubleday. ISBN 978-0-385-18286-7. Reagan, Ronald (1990). An American Life. New York: Simon & Schuster. ISBN 978-0-6716-9198-1. Reagan, Nancy (2002). I Love You, Ronnie: The Letters of Ronald Reagan to Nancy Reagan. New York: Random House. ISBN 978-0-375-76051-8. Reagan, Ronald (2003). Skinner, Kiron K.; Anderson, Annelise; Anderson, Martin (eds.). Reagan: A Life in Letters. New York: Simon & Schuster. ISBN 978-0-7432-1967-9. Reagan, Ronald (2007). Brinkley, Douglas (ed.). The Reagan Diaries. New York: HarperCollins. ISBN 978-0-0608-7600-5. "Ronald Reagan collected news and commentary". The New York Times. "Ronald Reagan collected news and commentary". The Guardian. Finding aid author: Elisa Visick. "Ronald Reagan radio programs". Prepared for the L. Tom Perry Special Collections, Provo, UT. Retrieved May 16, 2016. This page is based on the Wikipedia article Ronald Reagan; it is used under the Creative Commons Attribution-ShareAlike 3.0 Unported License (CC-BY-SA). You may redistribute it, verbatim or modified, providing that you comply with the terms of the CC-BY-SA.